Los objetos directos contestan las preguntas QUE o QUIEN Los objetos directos RECIBEN la acción del verbo. 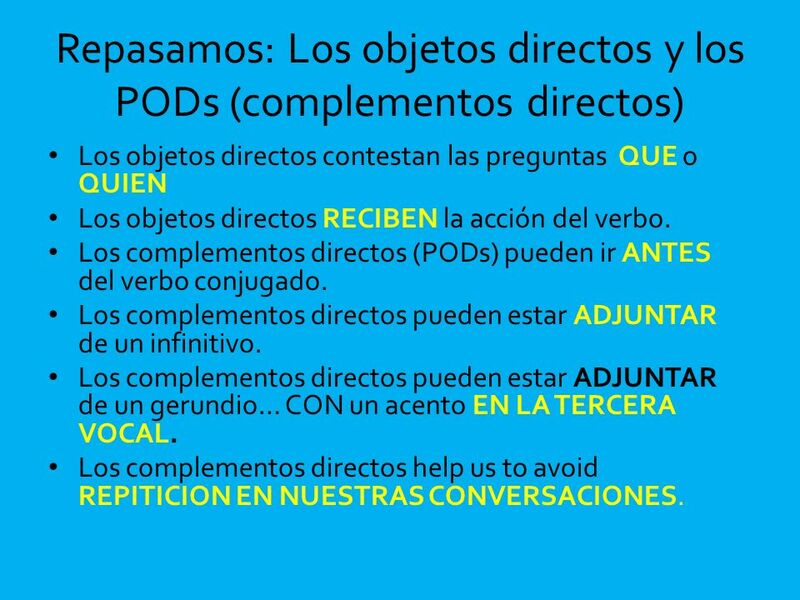 Los complementos directos (PODs) pueden ir ANTES del verbo conjugado. 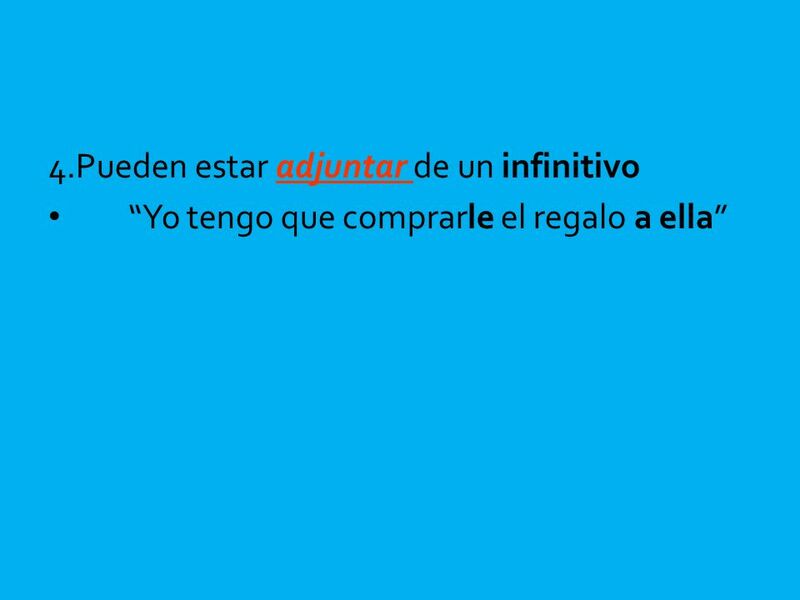 Los complementos directos pueden estar ADJUNTAR de un infinitivo. Los complementos directos pueden estar ADJUNTAR de un gerundio… CON un acento EN LA TERCERA VOCAL. 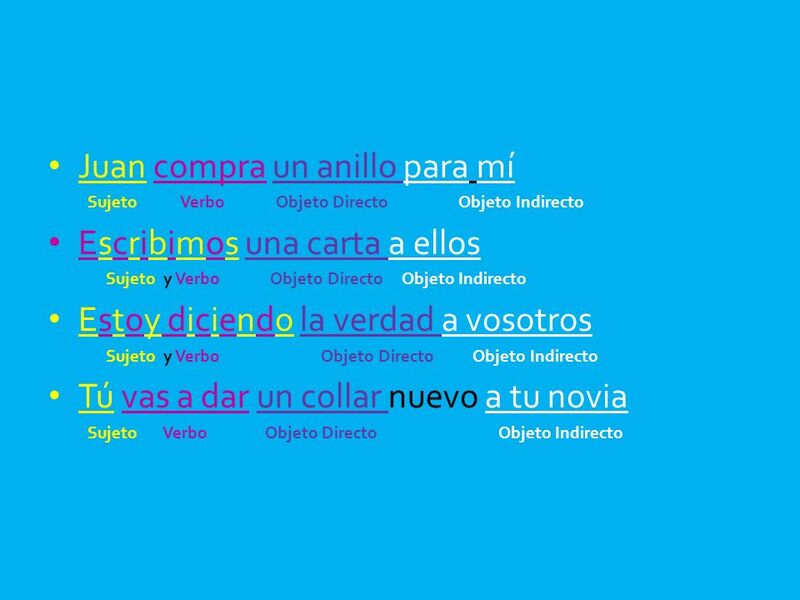 Los complementos directos help us to avoid REPITICION EN NUESTRAS CONVERSACIONES. 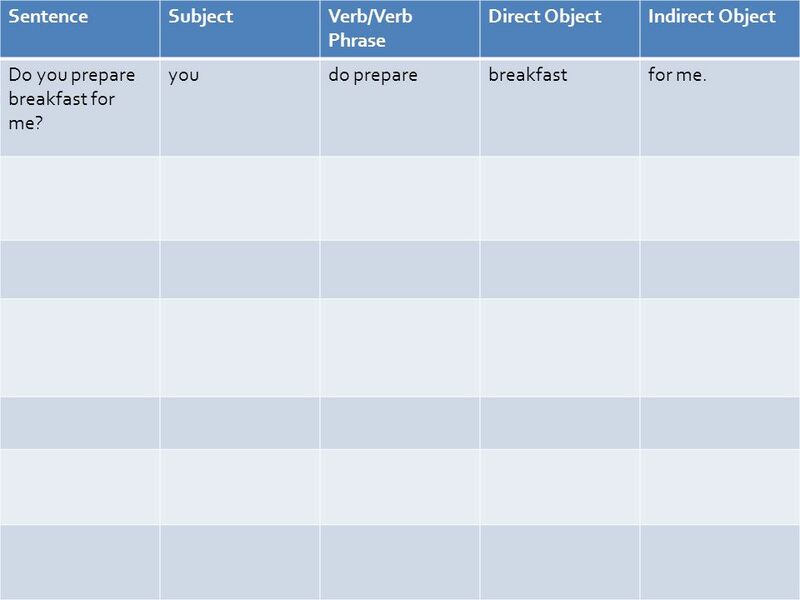 4 Sentence Subject Verb/Verb Phrase Direct Object Indirect Object Do you prepare breakfast for me? you do prepare breakfast for me. 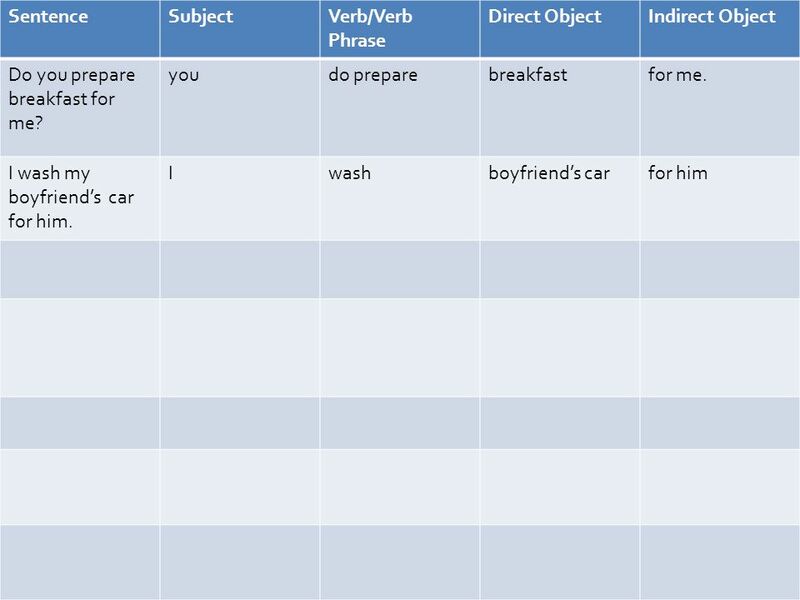 8 Sentence Subject Verb/Verb Phrase Direct Object Indirect Object Do you prepare breakfast for me? you do prepare breakfast for me. I wash my boyfriend’s car for him. I wash boyfriend’s car for him We are giving it (m) to y’all. We are giving it It to y’all My mother takes pictures for my grandma. My mother takes pictures for my grandma They talk to us. They talk to us. 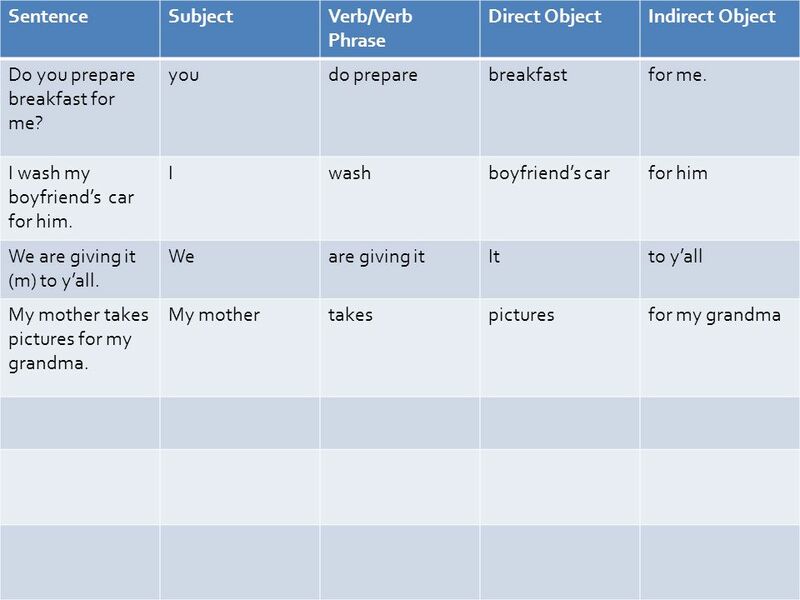 9 Sentence Subject Verb/Verb Phrase Direct Object Indirect Object Do you prepare breakfast for me? you do prepare breakfast for me. I wash my boyfriend’s car for him. I wash boyfriend’s car for him We are giving it (m) to y’all. We are giving it It to y’all My mother takes pictures for my grandma. My mother takes pictures for my grandma They talk to us. They talk to us. *Do all of you swim in the lake? all of you do swim the lake. 11 Do you prepare breakfast for me? 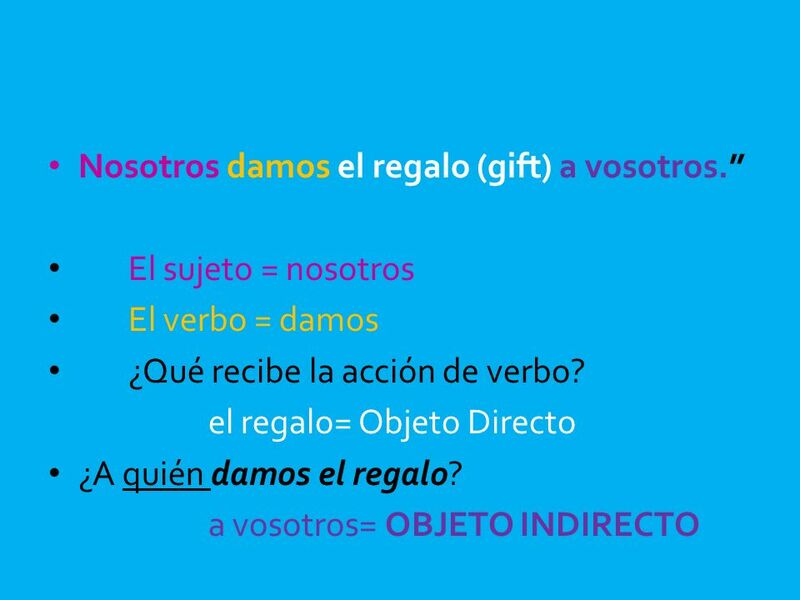 “Yo compro un regalo a ti.” OD = regalo OI = a ti FOR WHOM DO I BUY THE GIFT (OD). 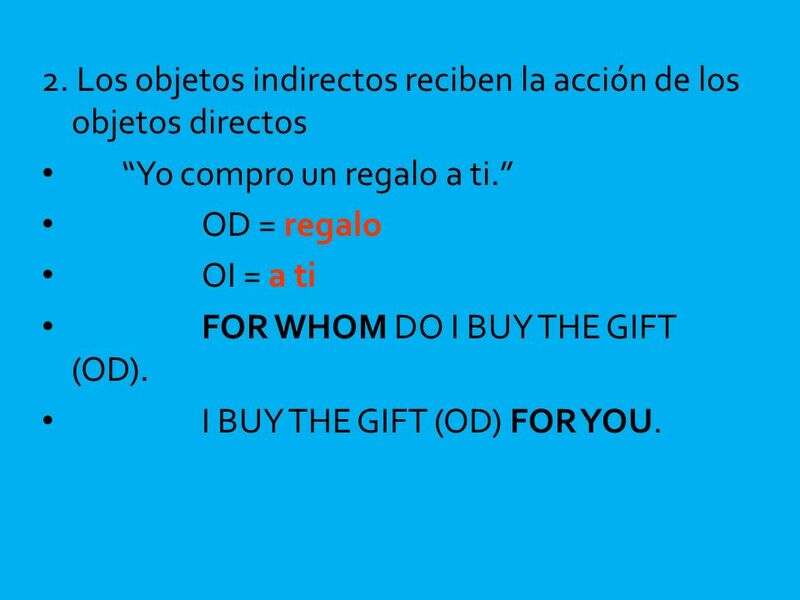 I BUY THE GIFT (OD) FOR YOU. 17 Ana pasa la pelota (the ball) a Marisa. 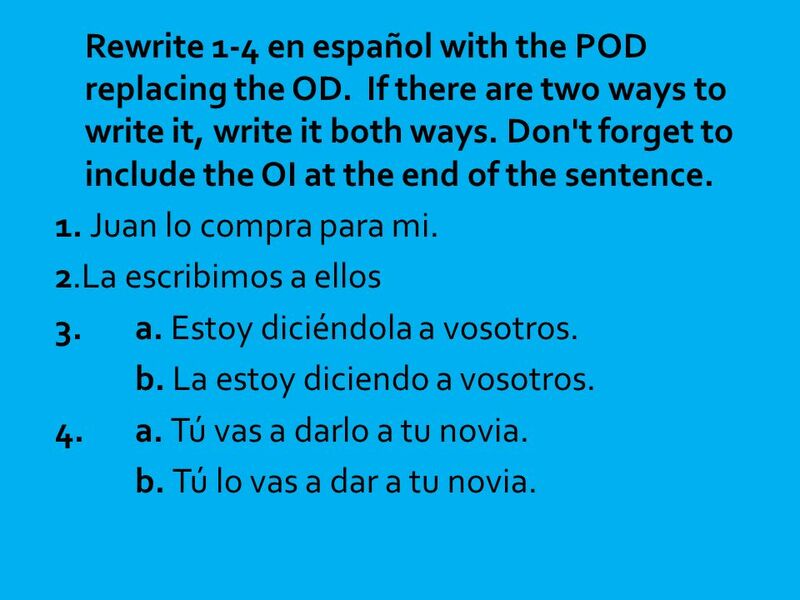 Rewrite 1-4 en español with the POD replacing the OD. If there are two ways to write it, write it both ways. 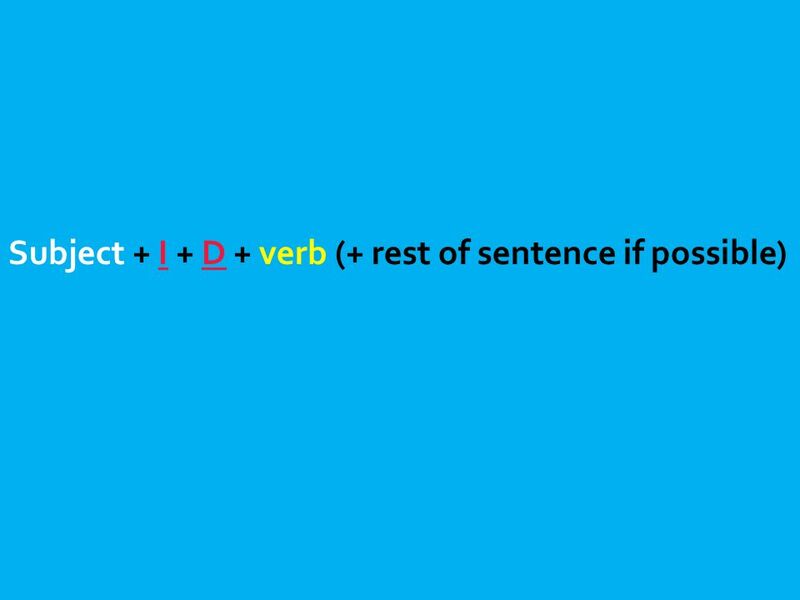 Don't forget to include the OI at the end of the sentence. 1. Juan lo compra para mi. 2.La escribimos a ellos 3. a. Estoy diciéndola a vosotros. b. La estoy diciendo a vosotros. 4. a. Tú vas a darlo a tu novia. b. Tú lo vas a dar a tu novia. 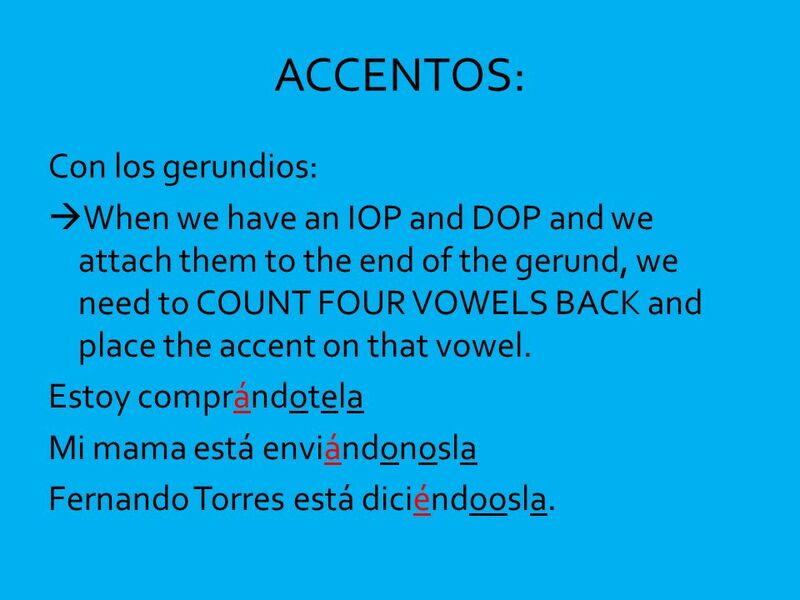 41 ACCENTOS: Con los gerundios: When we have an IOP and DOP and we attach them to the end of the gerund, we need to COUNT FOUR VOWELS BACK and place the accent on that vowel. Estoy comprándotela Mi mama está enviándonosla Fernando Torres está diciéndoosla. 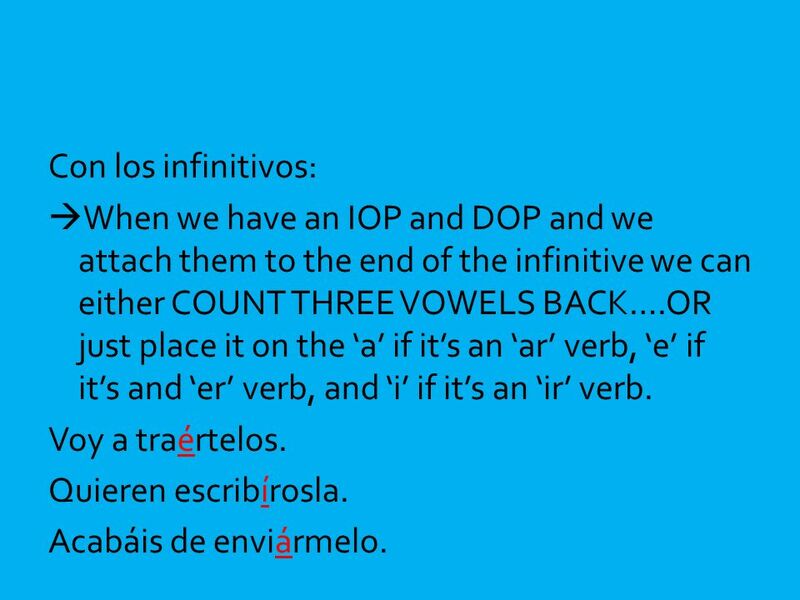 42 Con los infinitivos: When we have an IOP and DOP and we attach them to the end of the infinitive we can either COUNT THREE VOWELS BACK….OR just place it on the ‘a’ if it’s an ‘ar’ verb, ‘e’ if it’s and ‘er’ verb, and ‘i’ if it’s an ‘ir’ verb. Voy a traértelos. Quieren escribírosla. Acabáis de enviármelo. 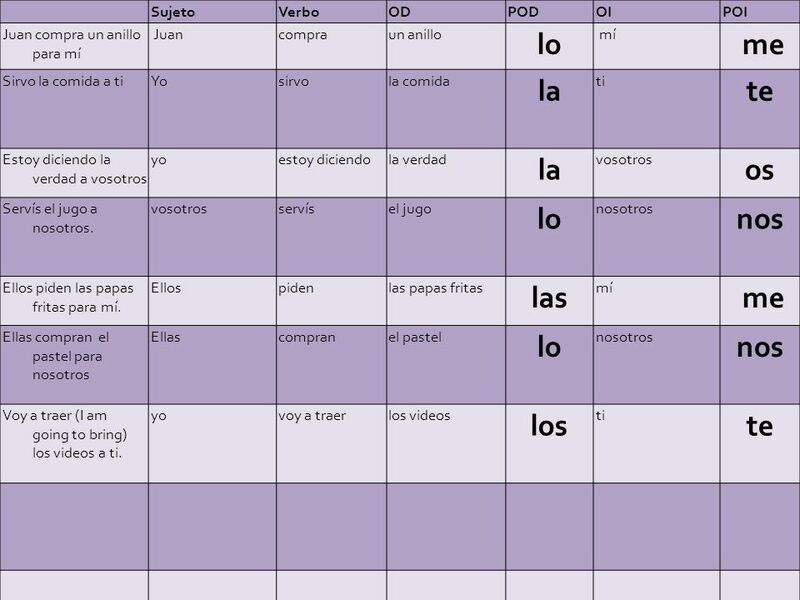 44 Rewrite #s 1-9 en español with the POIs and PODs enfrente del verbo conjugado. If there are two ways to write it, write it both ways. Also, write the English 1. Juan me lo compra.Juan buys me it. 2. Yo te la sirvo.I serve it to you. 3. a. Yo estoy diciéndoosla. I am telling it to y’all. b. Yo os la estoy diciendo.  I am telling it to y’all 4. Vosotros nos lo servís.Y’all serve us it. 5. Ellos me las piden .They order them for me. 6. Ellas nos lo compran.  They buy it for us. 7.	a. Yo voy a traértelos.  I am going to bring them to you. b. Yo te los voy a traer . I am going to bring them to you. 8. a. Nosotros estamos llevándooslas.  We are carrying them to y’all. b. Nosotros os las estamos llevando.  We are carrying them to y’all. 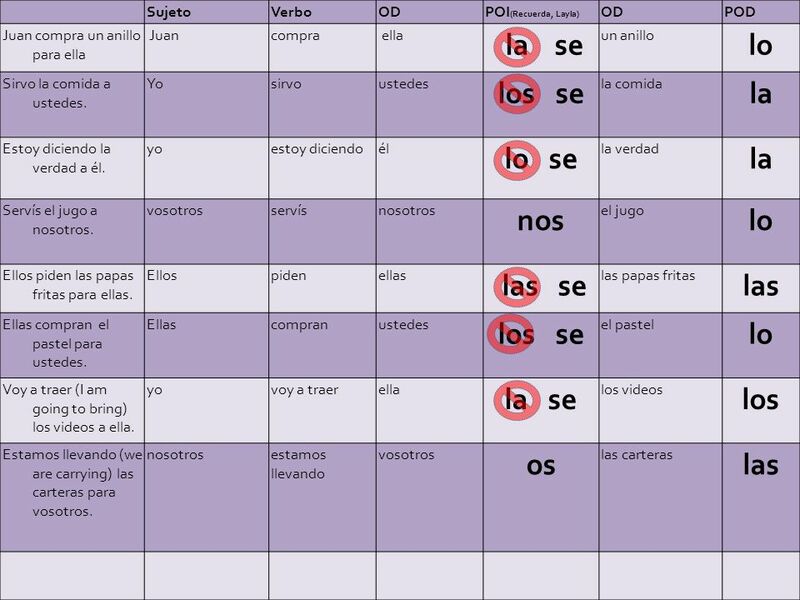 9. a. Nosotros vamos a escribírtela. We are going to write it for you. 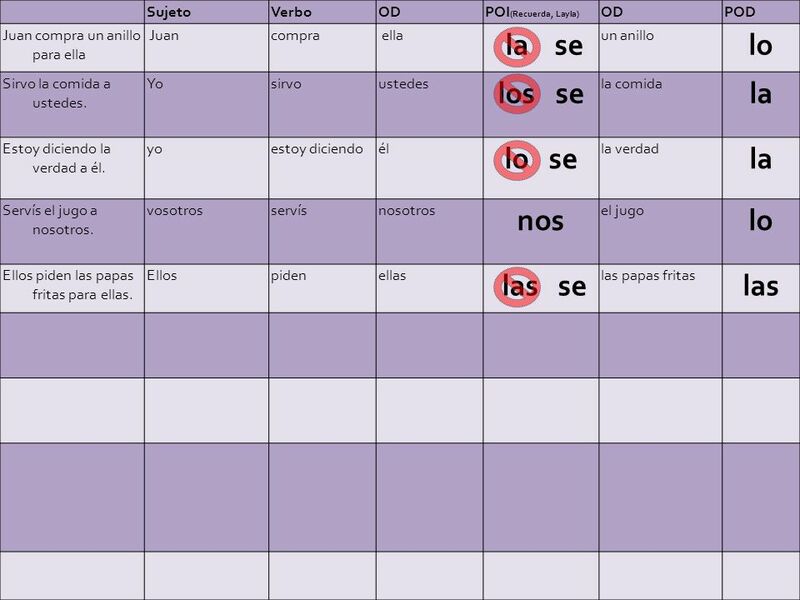 b. Nosotros te la vamos a escribir.  We are going to write it for you. 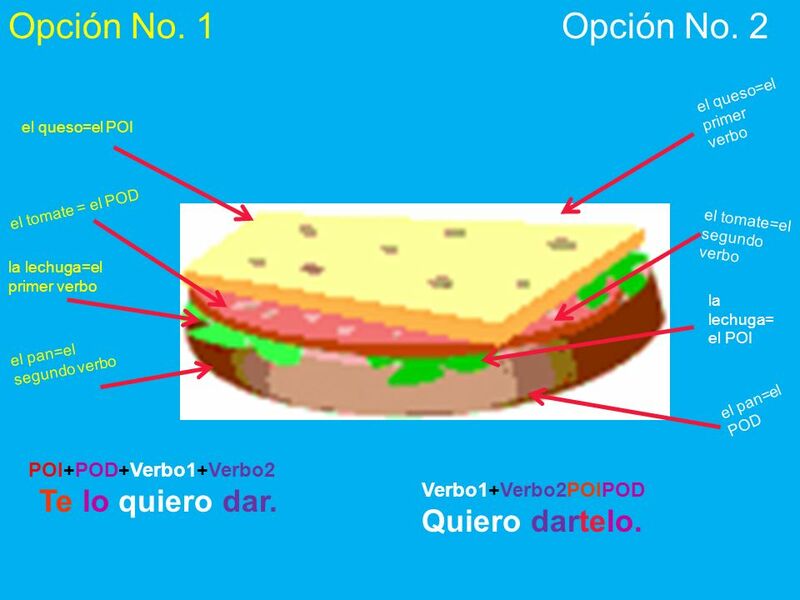 el queso=el primer verbo el queso=el POI el tomate = el POD el tomate=el segundo verbo la lechuga=el primer verbo la lechuga= el POI el pan=el segundo verbo el pan=el POD POI+POD+Verbo1+Verbo2 Te lo quiero dar. 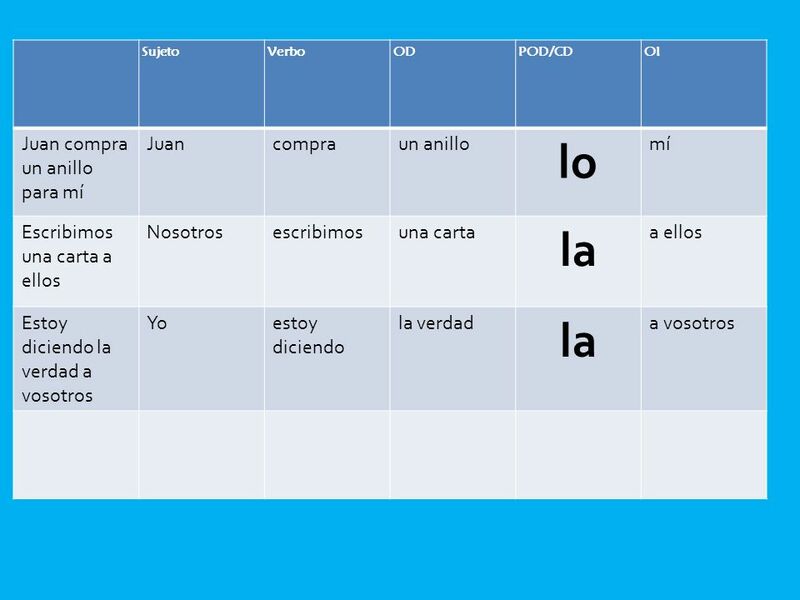 Verbo1+Verbo2POIPOD Quiero dartelo. 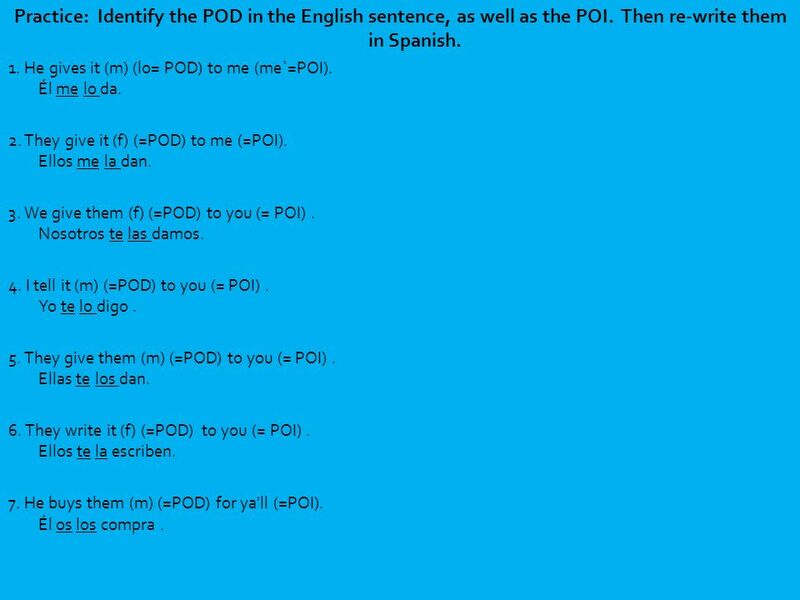 Practice: Identify the POD in the English sentence, as well as the POI. 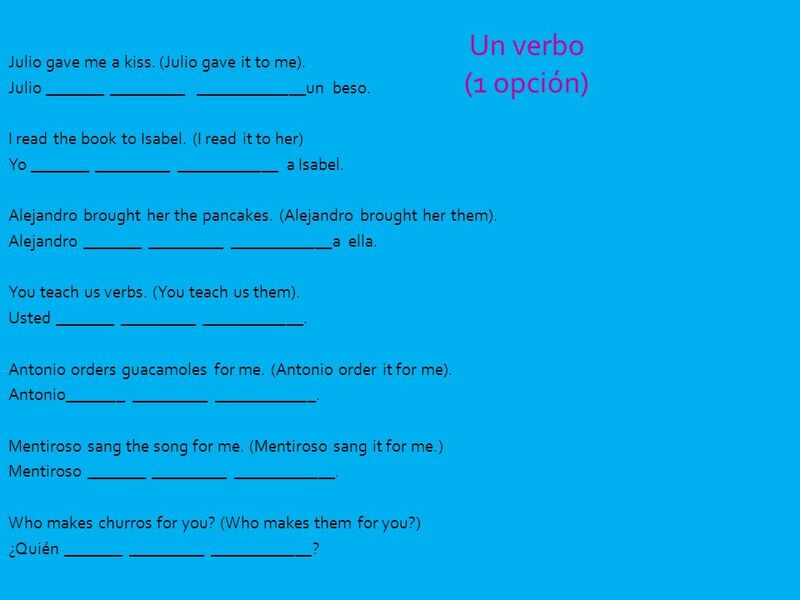 Then re-write them in Spanish. 1. 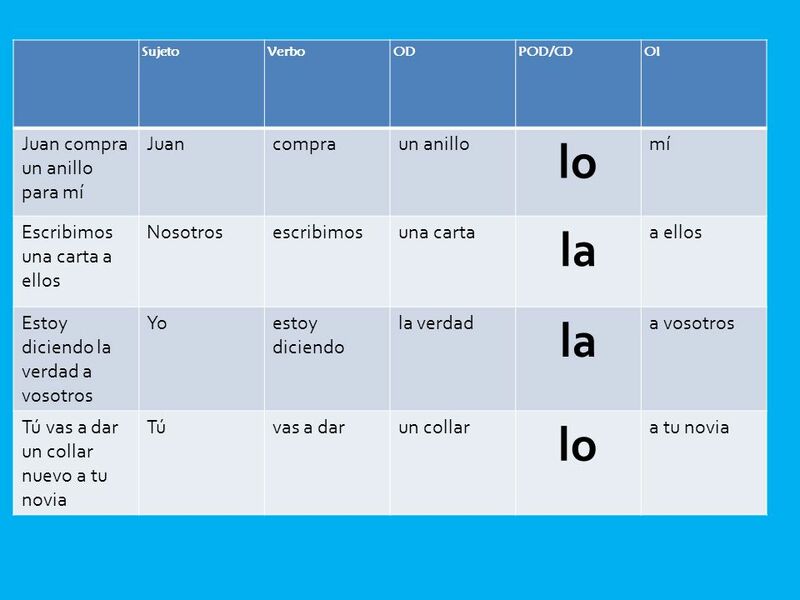 He gives it (m) (lo= POD) to me (me`=POI). Él me lo da. 2. They give it (f) (=POD) to me (=POI). Ellos me la dan. 3. We give them (f) (=POD) to you (= POI) . Nosotros te las damos. 4. I tell it (m) (=POD) to you (= POI) . Yo te lo digo . 5. They give them (m) (=POD) to you (= POI) . Ellas te los dan. 6. They write it (f) (=POD) to you (= POI) . Ellos te la escriben. 7. He buys them (m) (=POD) for ya'll (=POI). Él os los compra . 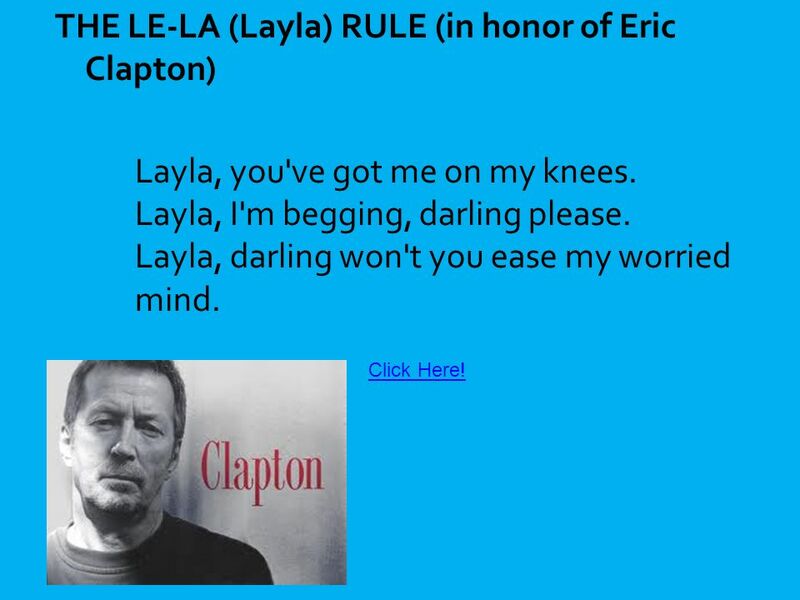 Layla, you've got me on my knees. Layla, I'm begging, darling please. Layla, darling won't you ease my worried mind. Click Here! 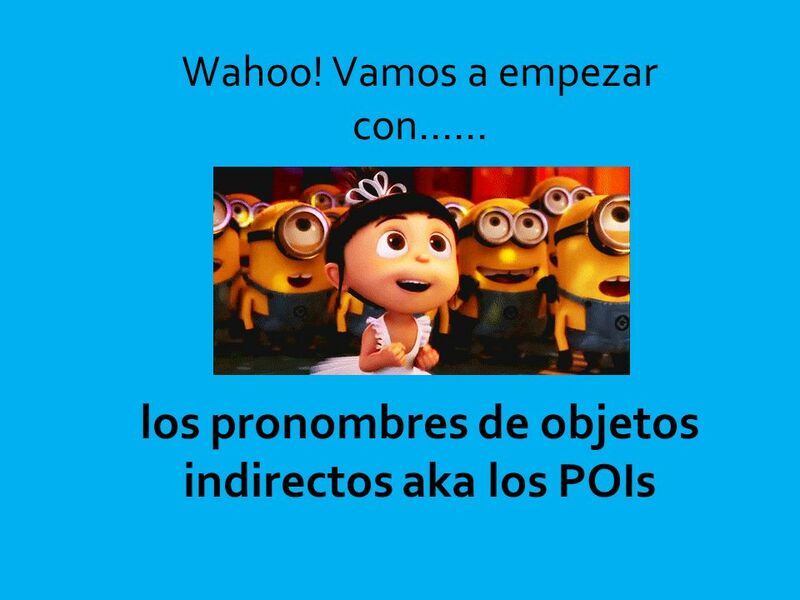 51 Pero….maestra, no entendemos, ¿¿por que cambiamos los pronombres?? 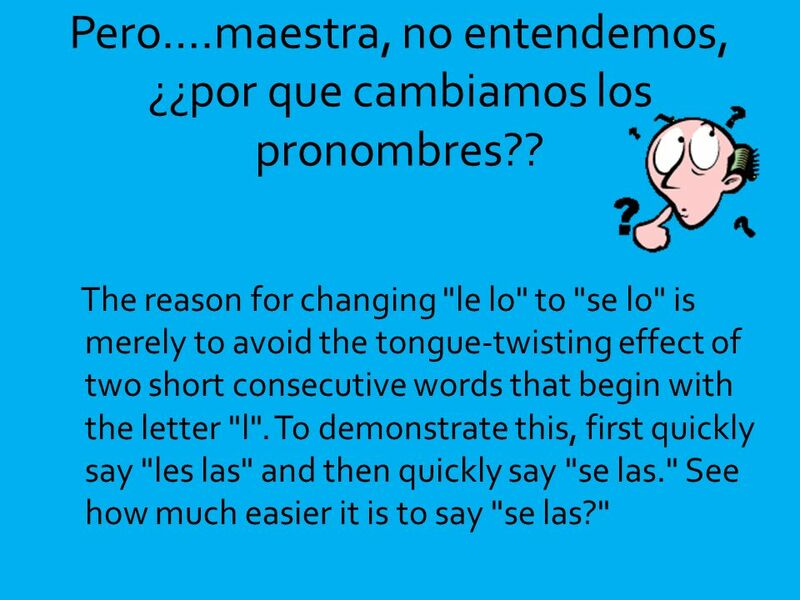 The reason for changing "le lo" to "se lo" is merely to avoid the tongue-twisting effect of two short consecutive words that begin with the letter "l". 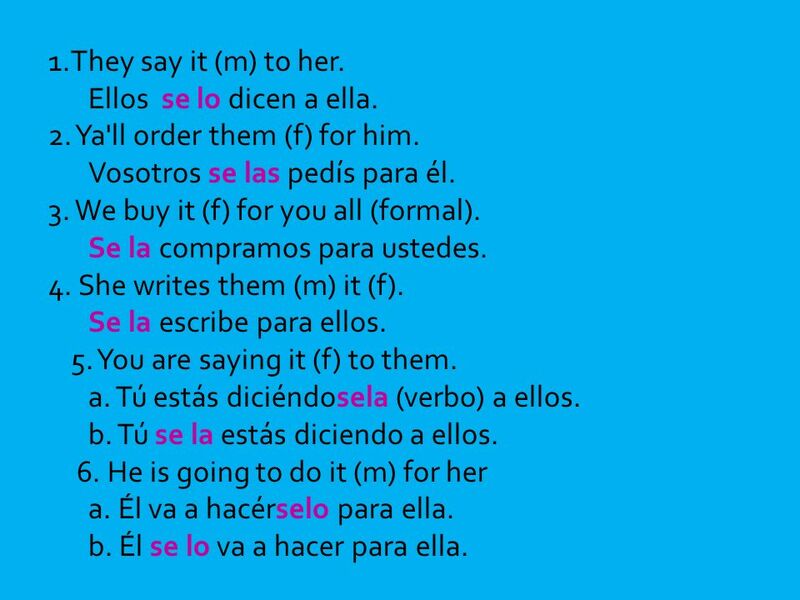 To demonstrate this, first quickly say "les las" and then quickly say "se las." 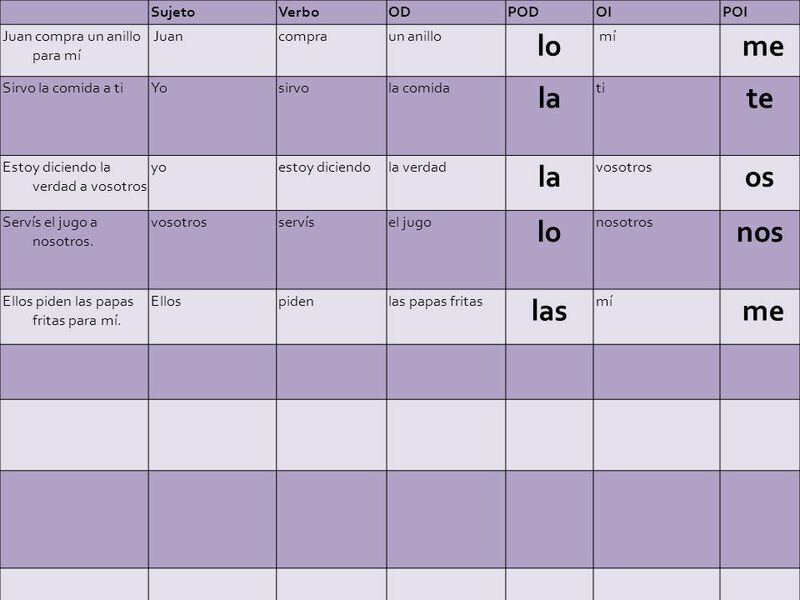 See how much easier it is to say "se las?" 61 1. Juan se lo compra para ella. 2. Se la sirvo a ustedes. 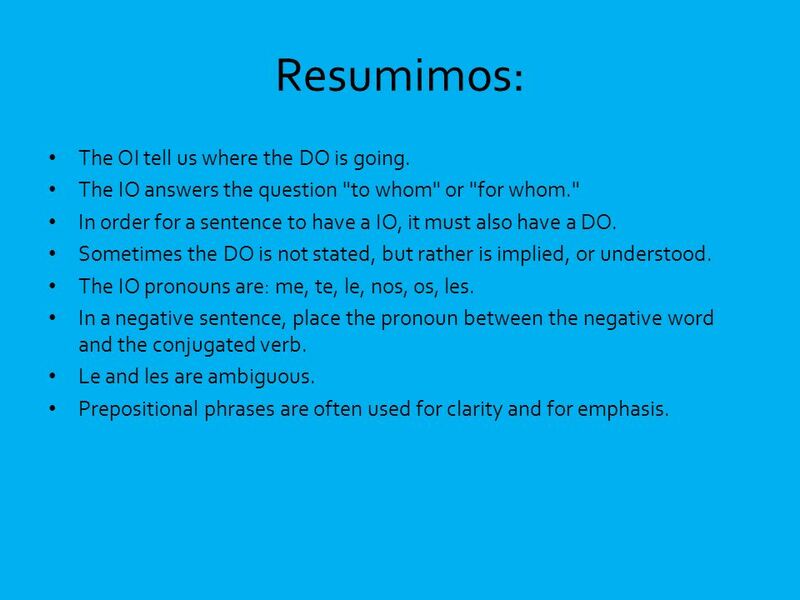 Re-escribe los números 1-10 en español con el pronombre directo y el pronombre indirecto. Si hay dos opciones, escribe las dos. 1. Juan se lo compra para ella. 2. Se la sirvo a ustedes. 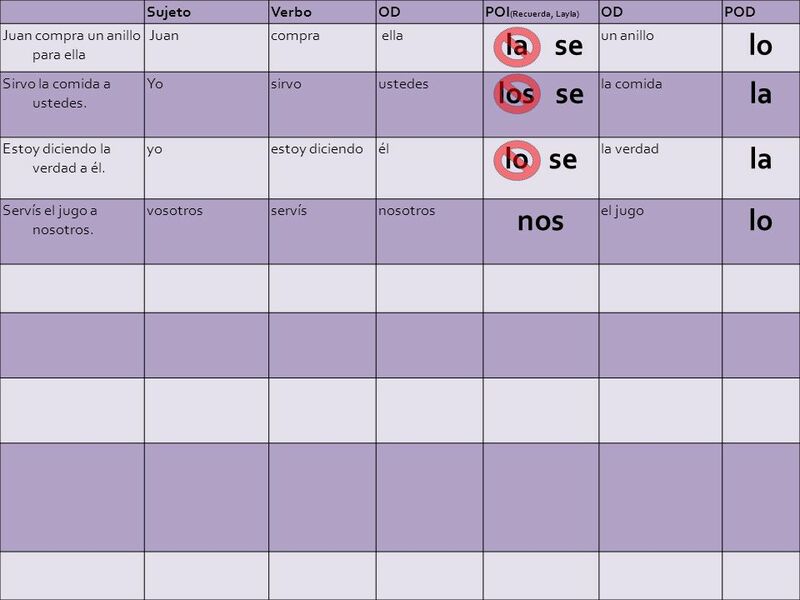 3. a. Estoy diciéndosela a él. b. Se la estoy diciendo a él. 4. Nos lo servís. 5. Ellos se las piden para ellas. 6. Ellas se lo compran para ustedes. 7.	a. Voy a traérselos a ella. b. Se los voy a traer a ella. 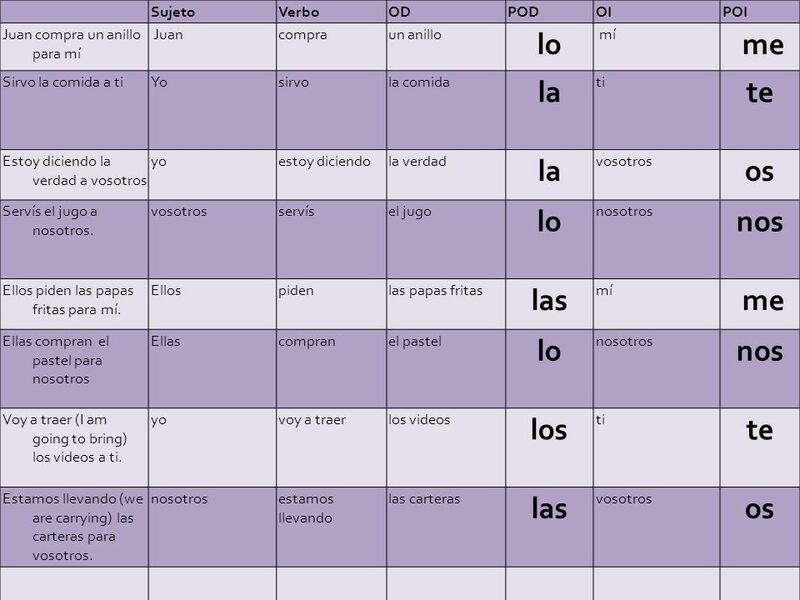 8. a. Estamos llevándooslas. b. Os las estamos llevando. 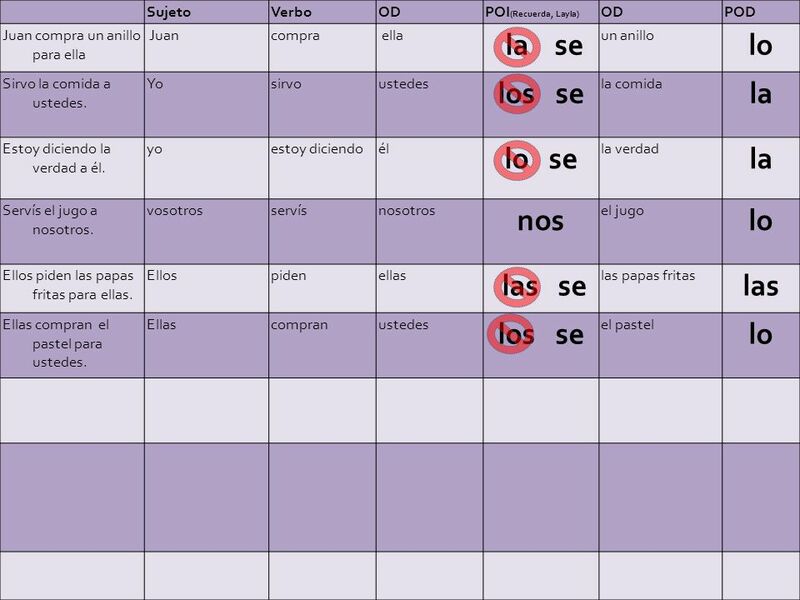 9. a. Vamos a escribírtela. b. Te la vamos a escribir. 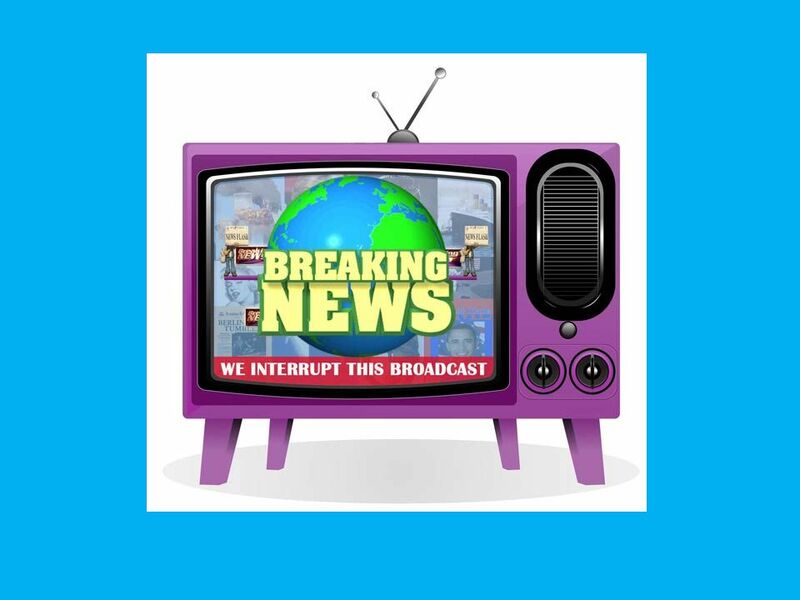 FYI: We keep the prepositional phrase here for clarification or extra emphasis. To WHOM is Victoria giving the gift to? Him? Her? You? 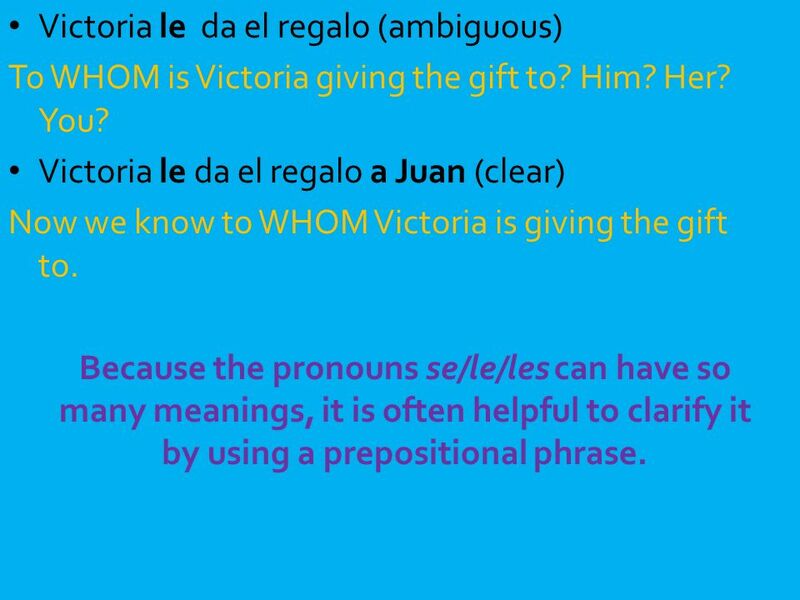 Victoria le da el regalo a Juan (clear) Now we know to WHOM Victoria is giving the gift to. 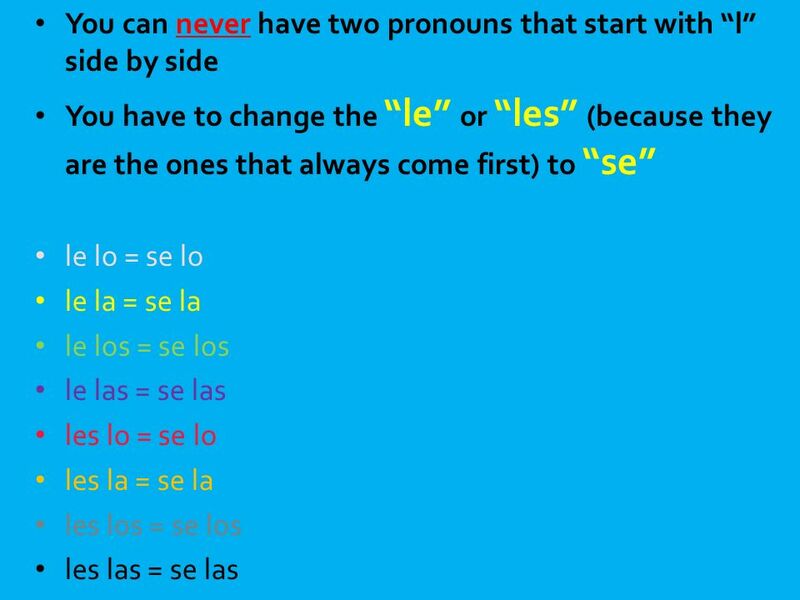 Because the pronouns se/le/les can have so many meanings, it is often helpful to clarify it by using a prepositional phrase. 63 Escribe el pronombre indirecto ANTES DE el pronombre directo. 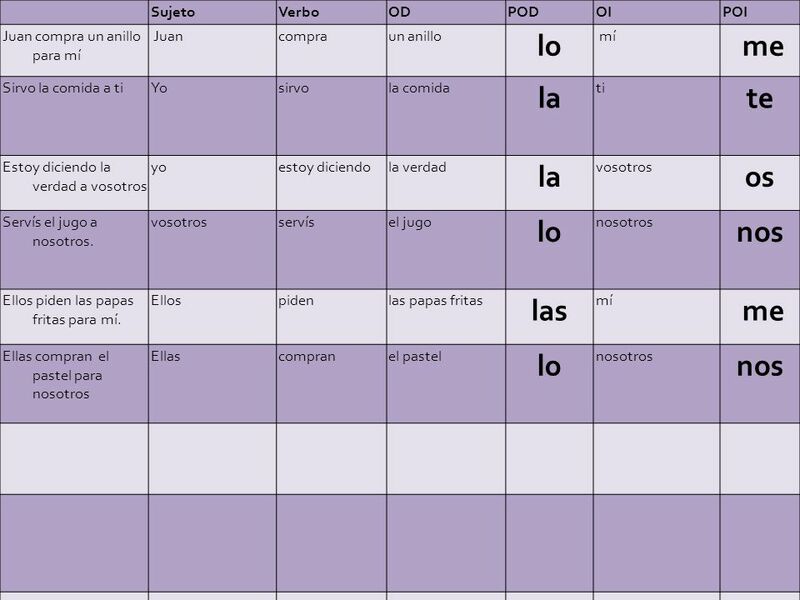 Más práctica – recuerda la regla de “LE-LA”  . Escribe el pronombre indirecto ANTES DE el pronombre directo. 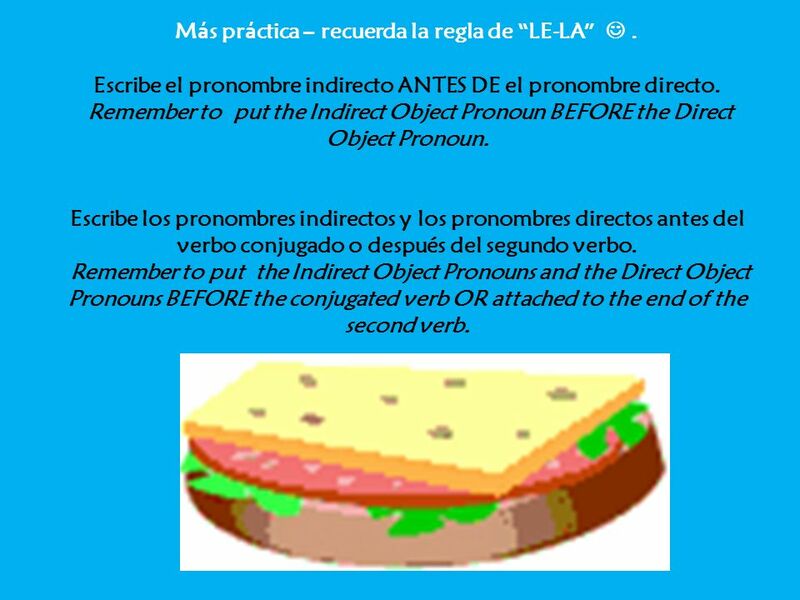 Remember to put the Indirect Object Pronoun BEFORE the Direct Object Pronoun. 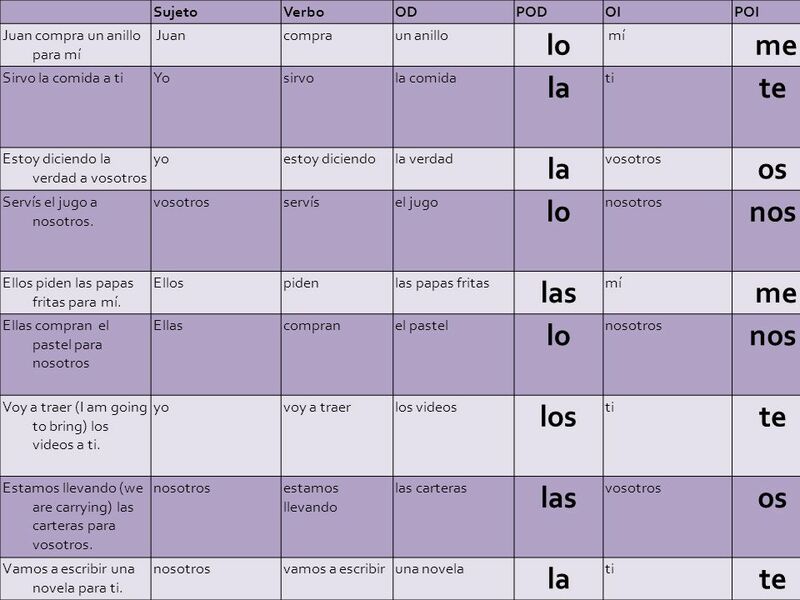 Escribe los pronombres indirectos y los pronombres directos antes del verbo conjugado o después del segundo verbo. 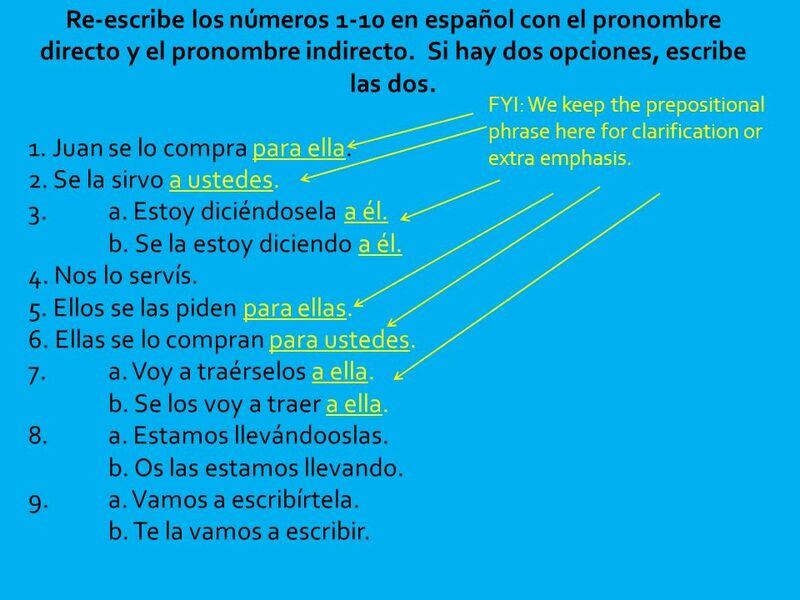 Remember to put the Indirect Object Pronouns and the Direct Object Pronouns BEFORE the conjugated verb OR attached to the end of the second verb. 64 They say it (m) to her. Ellos se lo dicen a ella. 2. Ya'll order them (f) for him. 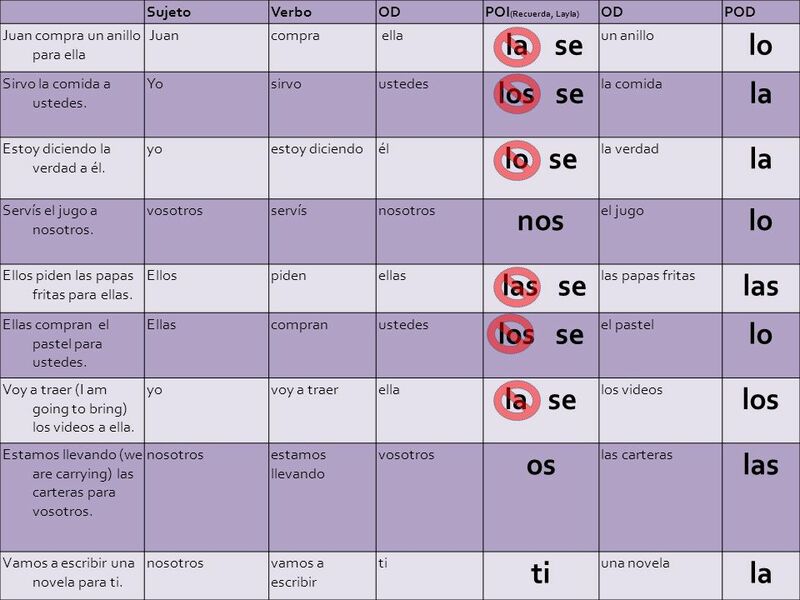 Vosotros se las pedís para él. 3. We buy it (f) for you all (formal). Se la compramos para ustedes. 4. She writes them (m) it (f). Se la escribe para ellos. 5. You are saying it (f) to them. a. Tú estás diciéndosela (verbo) a ellos. b. Tú se la estás diciendo a ellos. 6. He is going to do it (m) for her a. Él va a hacérselo para ella. b. Él se lo va a hacer para ella. 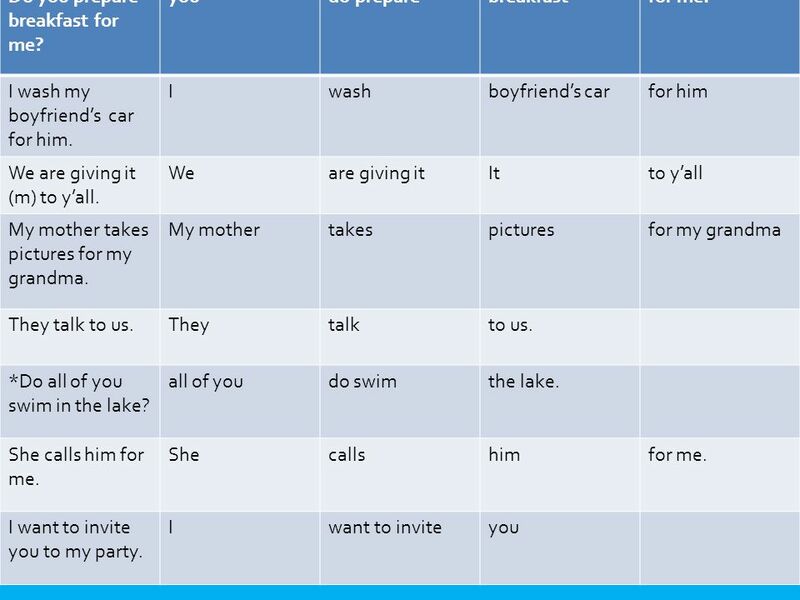 65 In negative sentences, the negative word comes directly before the first pronoun. No se lo tengo. I don't have it for you. Nunca se los compro. I never buy them for her. 66 She did not eat them (the pancakes). We did not give them (the creditcards) to you (familiar-Spain). 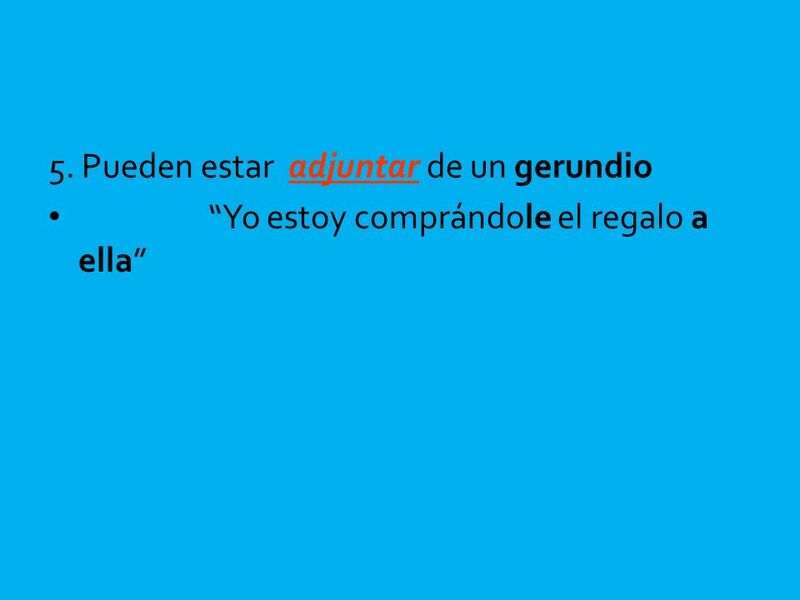 Laura wants to tell it (the story=el cuento) to you (familiar). We bought it (the ticket) for them (m). He doesn’t tell me the truth. (He doesn’t tell me it). They never send him gifts (regalos) because they don’t know his address. (They never send him them, because they don’t know it.) I don’t give her money. (I don’t give her it). The waiter (mesero) doesn’t sing the song to you. (The waiter doesn’t sing it to you). We don’t lend (prestar) them money. (We don’t lend them it). 67 She did not eat them (the pancakes). Ella no los comió. We did not give them (the creditcards) to you (familiar-Spain). No os las damos. 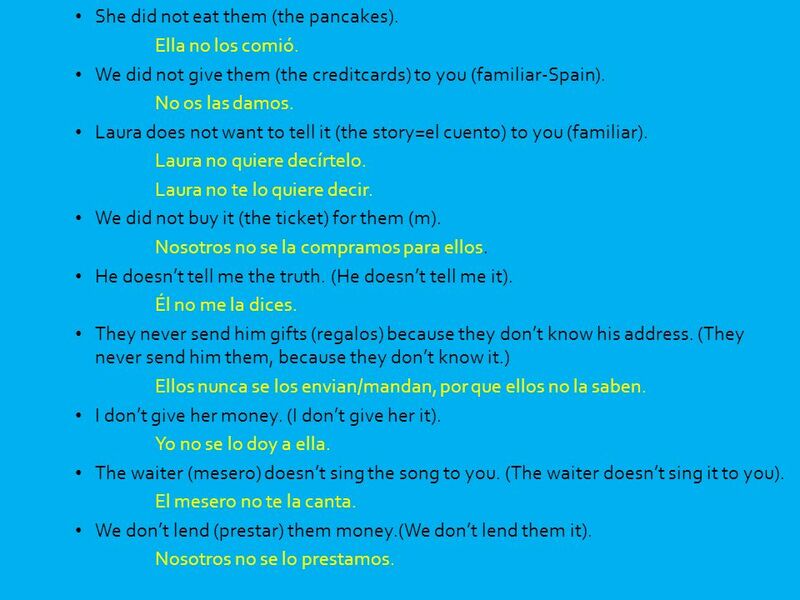 Laura does not want to tell it (the story=el cuento) to you (familiar). Laura no quiere decírtelo. Laura no te lo quiere decir. We did not buy it (the ticket) for them (m). Nosotros no se la compramos para ellos. He doesn’t tell me the truth. (He doesn’t tell me it). Él no me la dices. They never send him gifts (regalos) because they don’t know his address. (They never send him them, because they don’t know it.) Ellos nunca se los envian/mandan, por que ellos no la saben. I don’t give her money. (I don’t give her it). Yo no se lo doy a ella. The waiter (mesero) doesn’t sing the song to you. (The waiter doesn’t sing it to you). El mesero no te la canta. We don’t lend (prestar) them money. (We don’t lend them it). Nosotros no se lo prestamos. 68 Escribe en ingles: She did not eat them (the pancakes). Ella no los comió. 2. We did no give them (the creditcards) to you (familiar-Spain). Nosotros no os los dimos. 3. 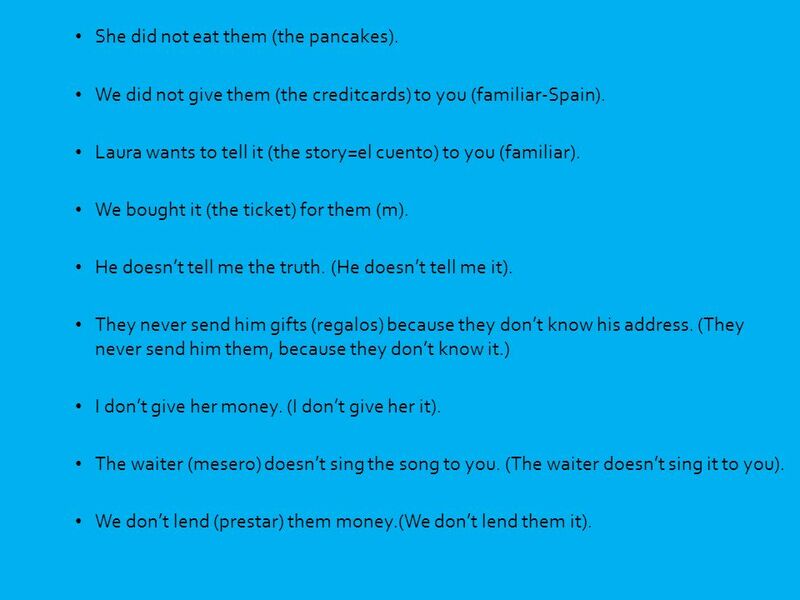 Laura does not want to tell it (the story=el cuento) to you (familiar). Laura no te lo quiere decir. Laura no quiere decirtelo. 4. 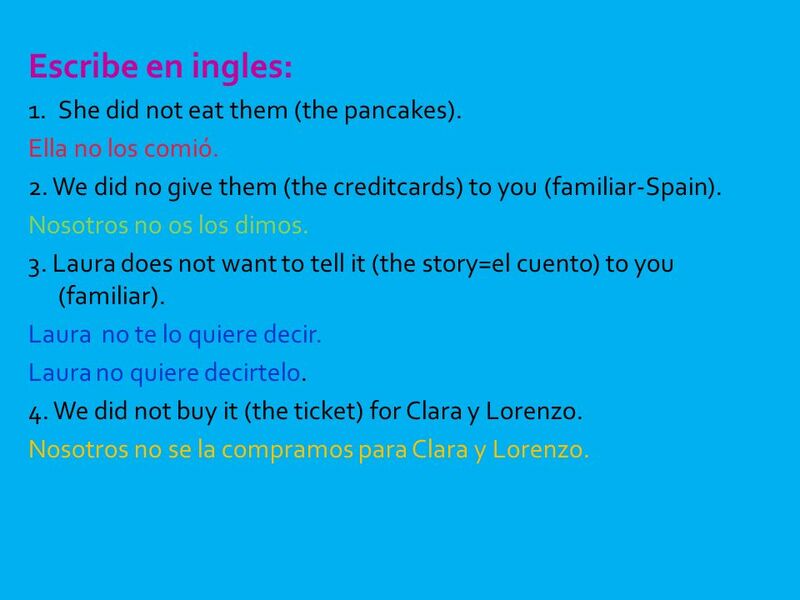 We did not buy it (the ticket) for Clara y Lorenzo. Nosotros no se la compramos para Clara y Lorenzo. 69 Un verbo (1 opción) Julio gave me a kiss. (Julio gave it to me). Julio _______ _________ _____________un beso. I read the book to Isabel. (I read it to her) Yo _______ _________ ____________ a Isabel. Alejandro brought her the pancakes. (Alejandro brought her them). Alejandro _______ _________ ____________a ella. 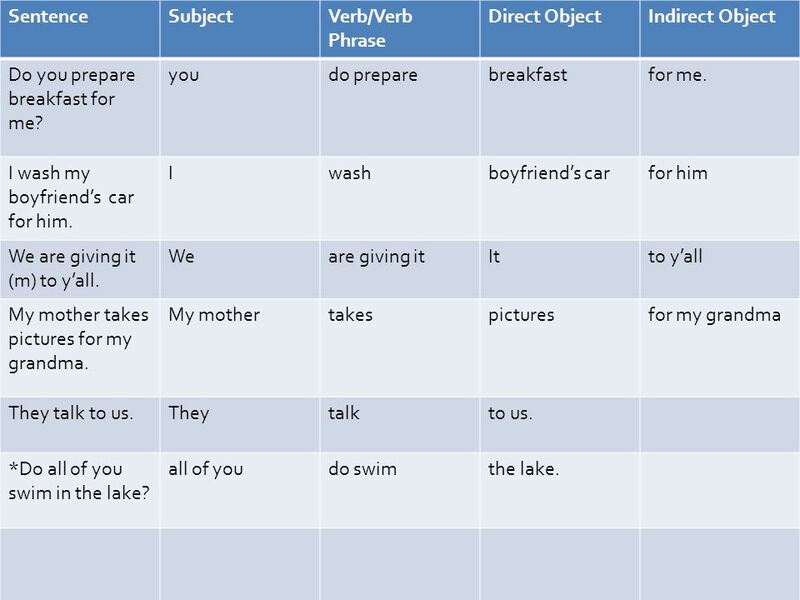 You teach us verbs. (You teach us them). Usted _______ _________ ____________. Antonio orders guacamoles for me. (Antonio order it for me). Antonio_______ _________ ____________. Mentiroso sang the song for me. (Mentiroso sang it for me.) Mentiroso _______ _________ ____________. Who makes churros for you? (Who makes them for you?) 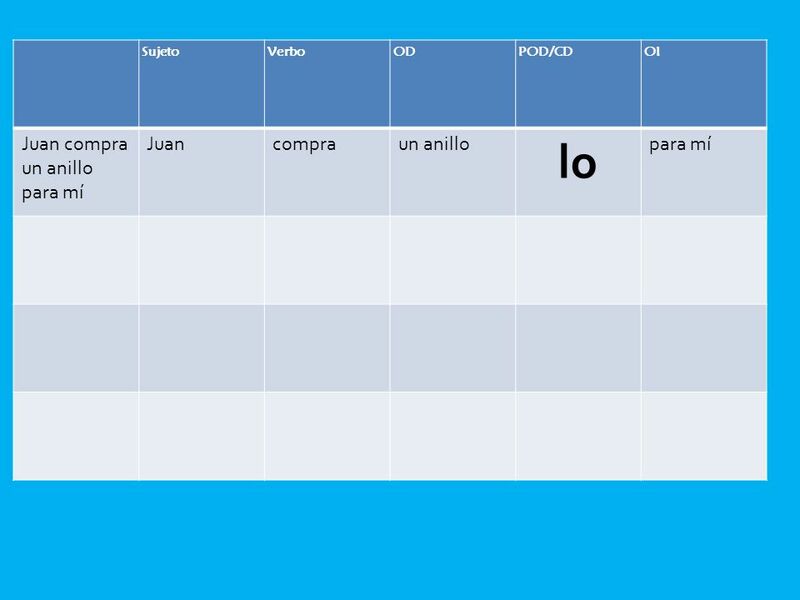 ¿Quién _______ _________ ____________? 70 Un verbo (1 opción) Julio gave me a kiss. (Julio gave it to me). Julio me lo dio. I read the book to Isabel. 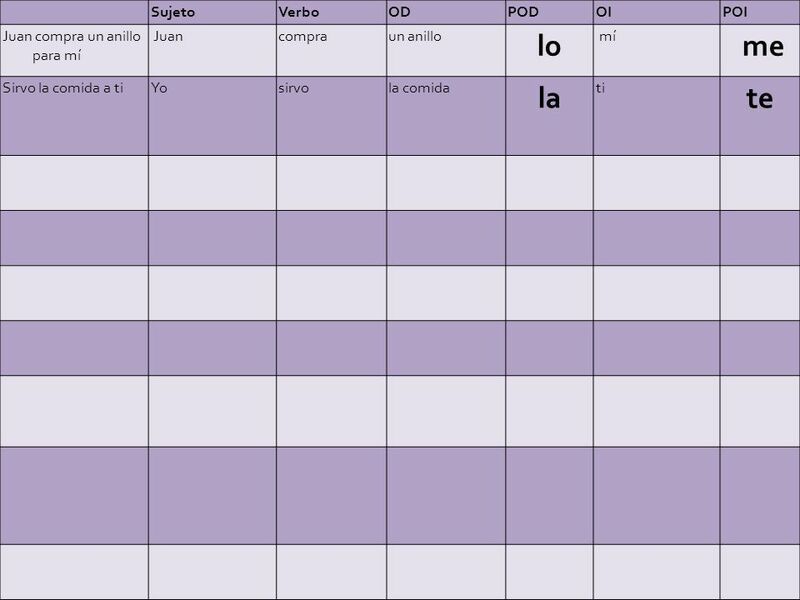 (I read it to her) Yo se lo leo a Isabel. Alejandro brought her the pancakes. (Alejandro brought her them). Alejandro se los trajo a ella. 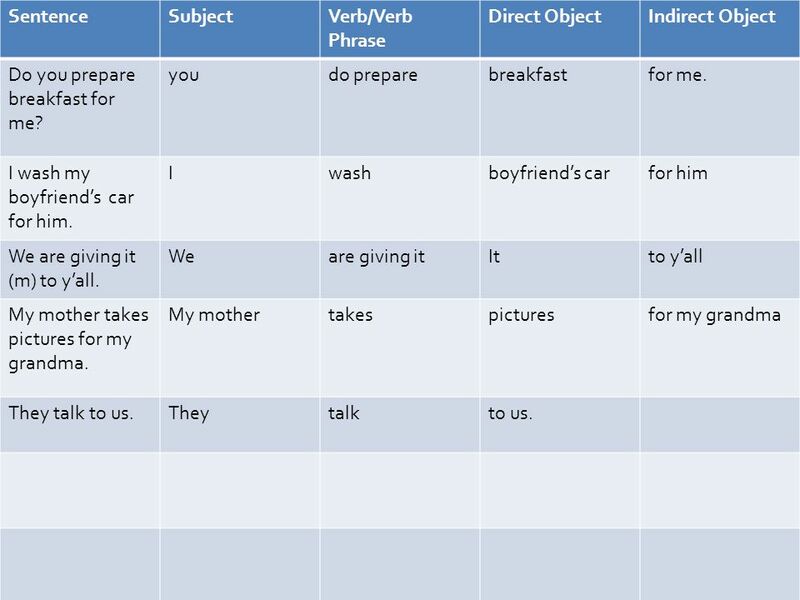 You teach us verbs. (You teach us them). Usted nos los enseña. Antonio orders guacamole for me. (Antonio order it for me). 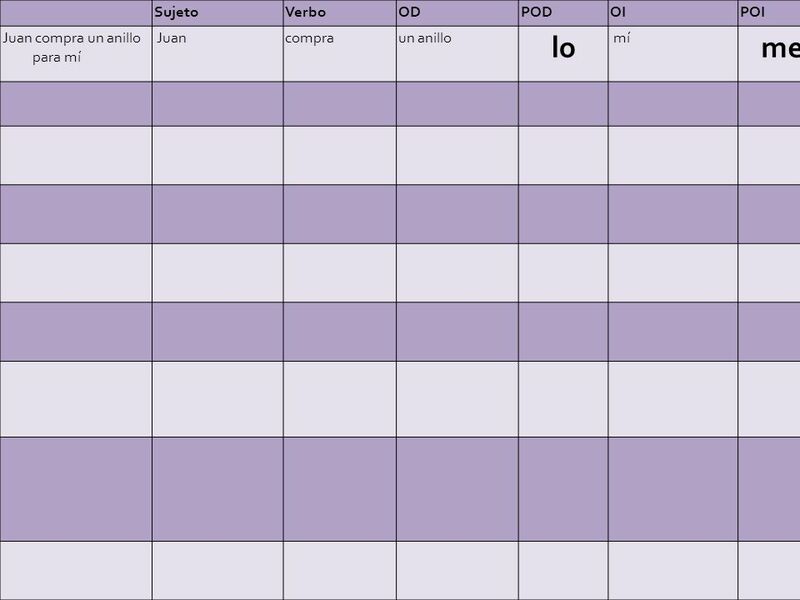 Antonio me lo pide. Mentiroso sang the song for me. (Mentiroso sang it for me.) Mentiroso me la cantó. Who makes churros for you? (Who makes them for you?) ¿Quién te los hace? Modelo: Él te lo quiere dar. Él quiere dártelo. Él no te lo quiere dar. Él no quiere dártelo. (inglés) He wants to give you it (it to you). / He does not want to give you it (it to you). Ella me lo debe explicar. Ella debe explicármelo. Ella no me lo debe explicar. Ella no debe explicármelo. (inglés) She must explain it to me. / She must not explain it to me. 2. Te lo quiero decir. Quiero decírtelo. No te lo quiero decir. No quiero decírtelo. (inglés) I want to tell it to them. / I don’t want to tell it to them. 3. Se la necesitas enviar a ellos. Necesitas enviársela a ellos. No se la necesitas enviar a ellos. No necesitas enviársela a ellos. 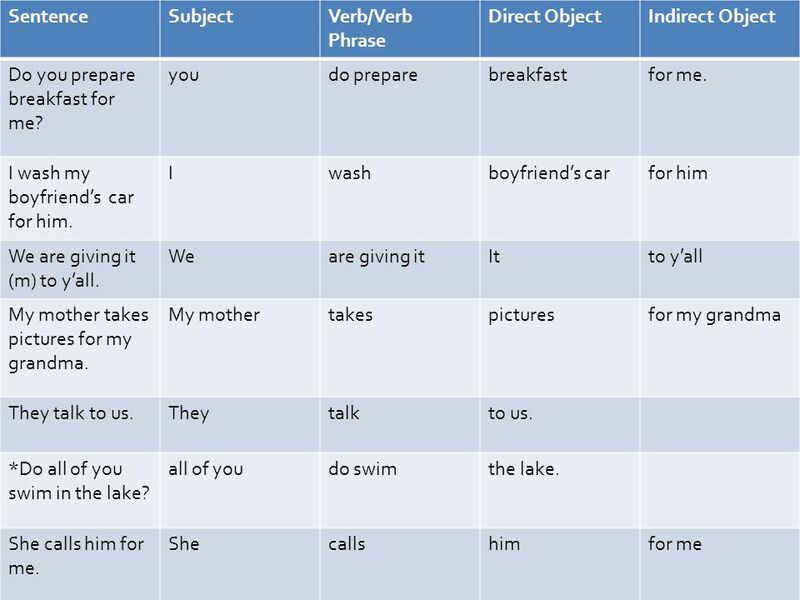 (inglés) You need to send it to them. / You don’t need to send it to them. (2 opciones) Modelo: Él te lo está dando. Él no te lo está dando. Él está dándotelo. Él no está dándotelo. Se los estamos pidiendo para ustedes. Estamos pidiéndoselos para ustedes. No se los estamos pidiendo para ustedes. No estamos pidiéndoselos para ustedes. 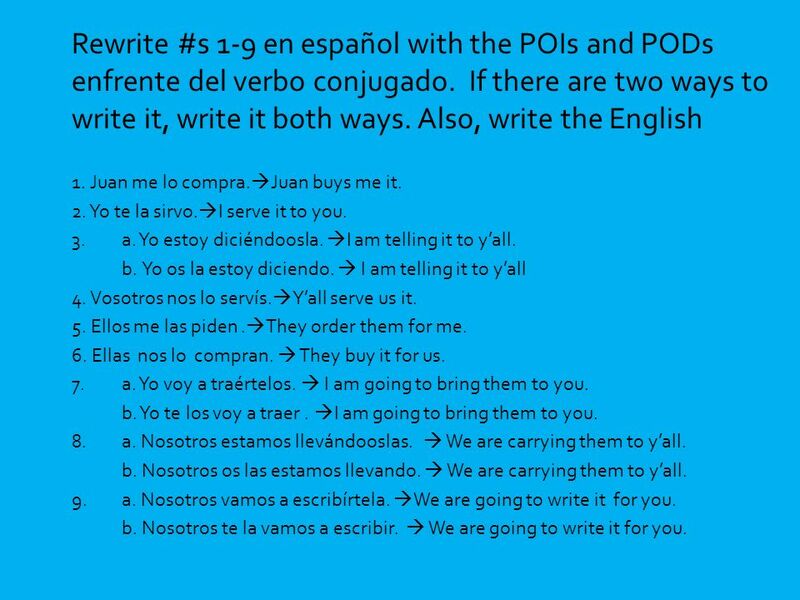 (inglés) We are ordering them for you. / We are not ordering it for you. 2. Me la están ofreciendo. Están ofreciéndomela. No me la están ofreciendo. No están ofreciéndomela. 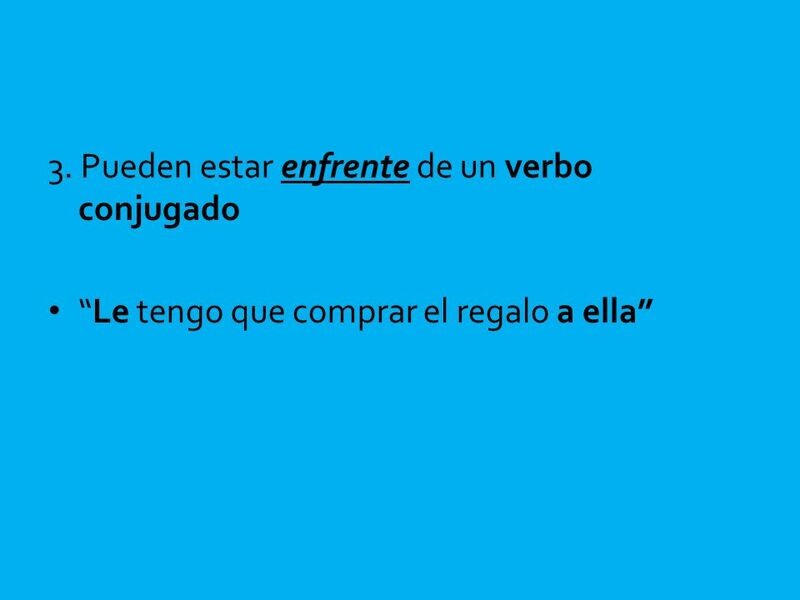 (inglés) They are offering it to me. / They are not offering it to me. 3. Nos lo estáis recomiendo. Estáis recomiéndonoslo. No nos lo estáis recomiendo. No estáis recomiéndonoslo. (inglés) Y’all are recommending it to us. / Y’all are not recommending it to us. 4. Se las estoy diciendo a él. Estoy diciéndoselas a él. No se las estoy diciendo a él. No estoy diciéndoselas a él. 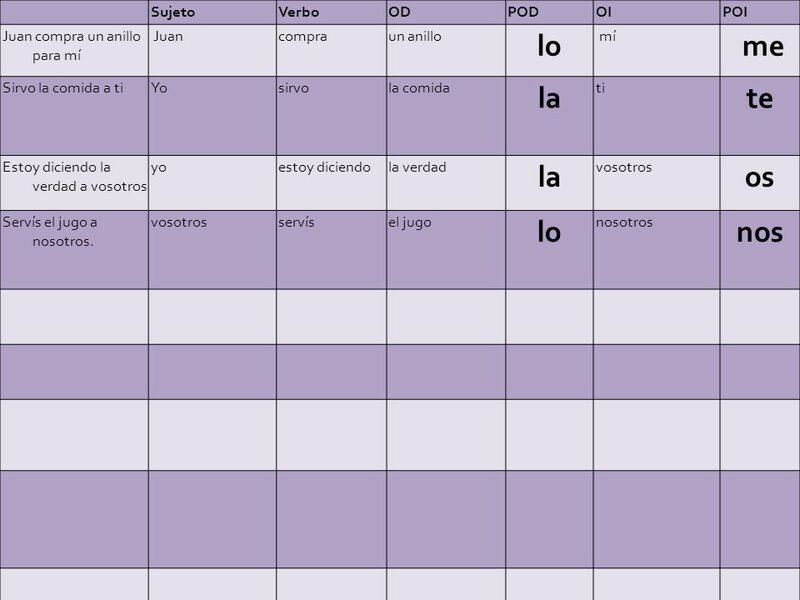 (inglés) I am telling them to him. / I am not tell them to him. 73 Resumimos: The OI tell us where the DO is going. The IO answers the question "to whom" or "for whom." In order for a sentence to have a IO, it must also have a DO. Sometimes the DO is not stated, but rather is implied, or understood. 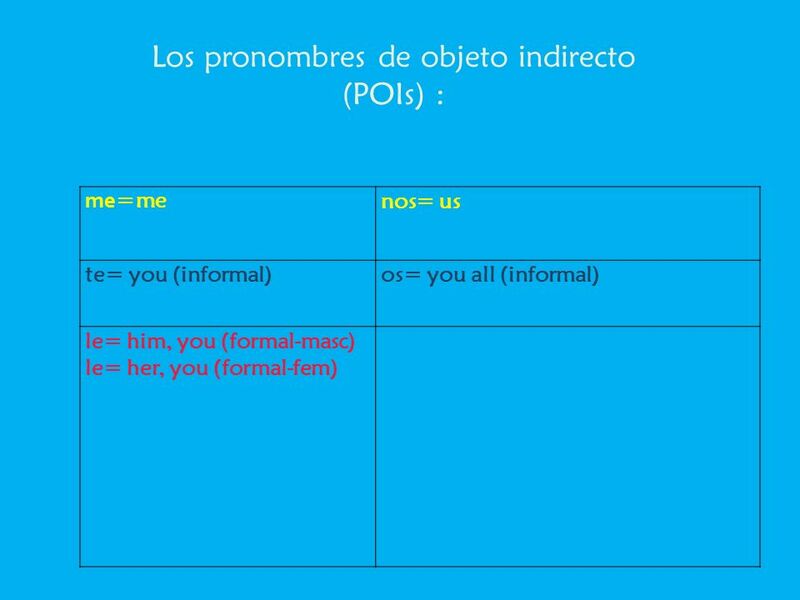 The IO pronouns are: me, te, le, nos, os, les. 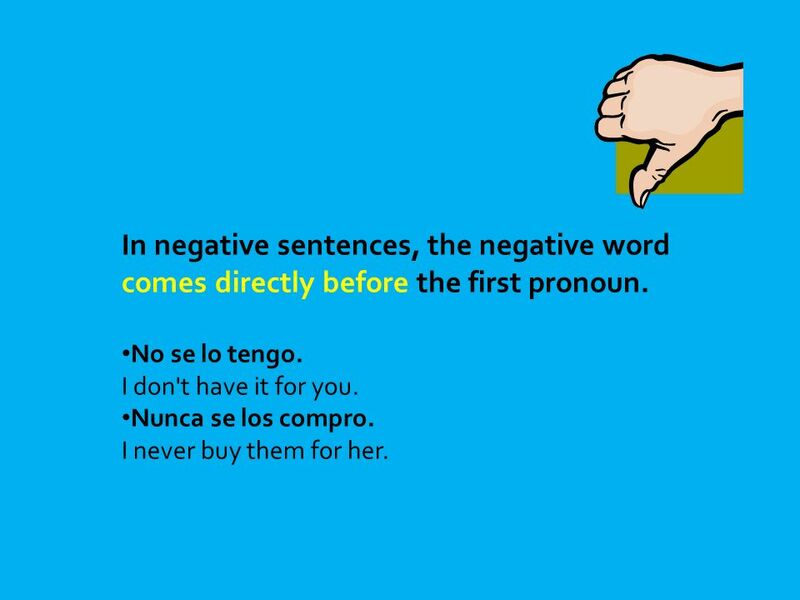 In a negative sentence, place the pronoun between the negative word and the conjugated verb. Le and les are ambiguous. 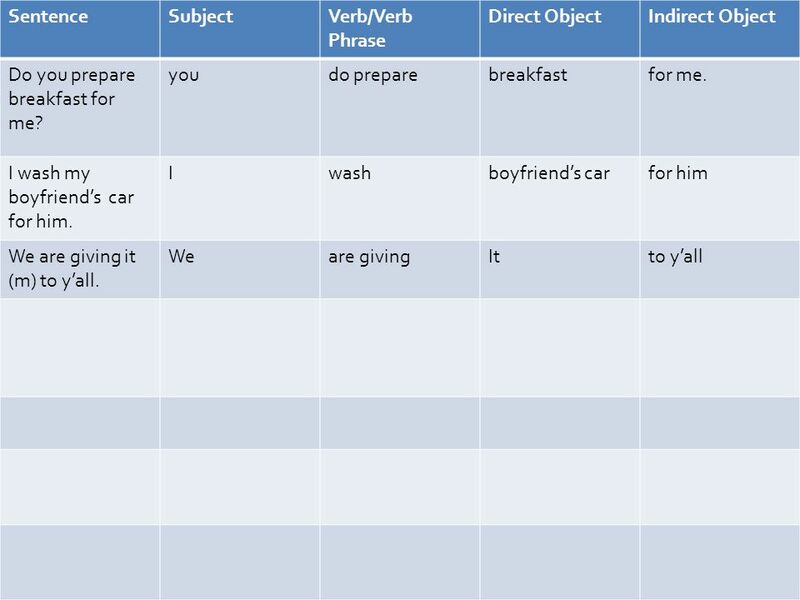 Prepositional phrases are often used for clarity and for emphasis. 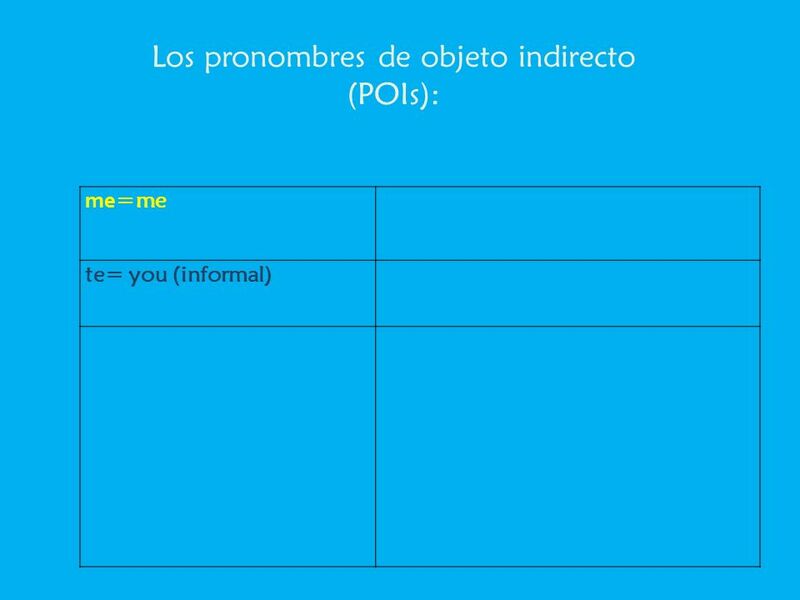 Descargar ppt "los pronombres de objetos indirectos aka los POIs"
¿Cuál es la función del pronombre? 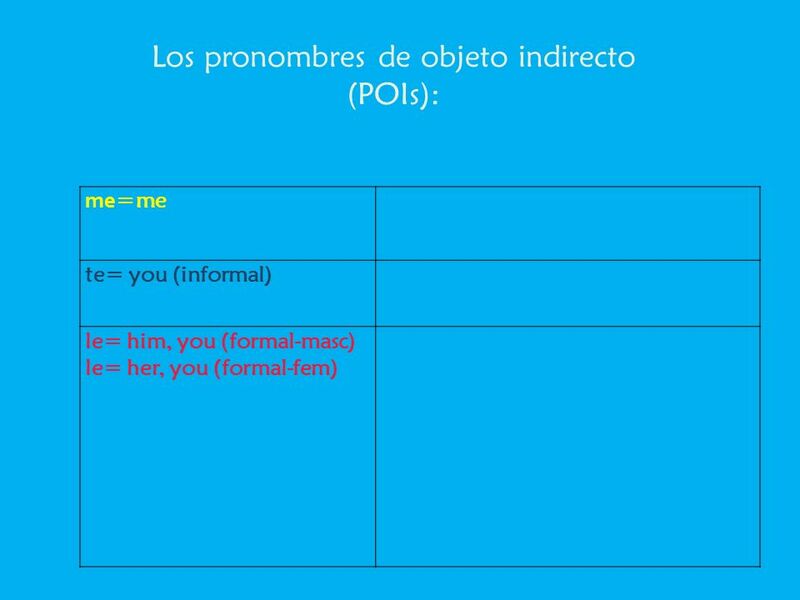 Direct Object Pronouns Direct Objects Diagram each part of these English sentences: I want that skirt. You bought some shoes. What is the subject and. 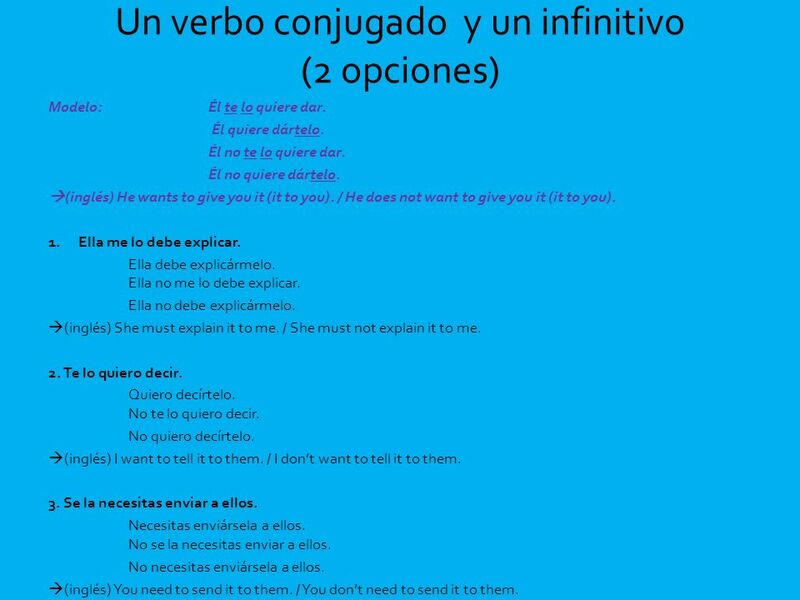 Los Pronombres Pronouns Textbook pg Outline 1.Single Verb Object Placement 2.Progressive Tense 3.Ir a + Infinitive 4.Tener que + Infinitive 5.Verb. 1. He spoke to us for 2 hours! 2. We bought them. (los zapatos) 3. I saw it! (la película) 4. I am going to do it. 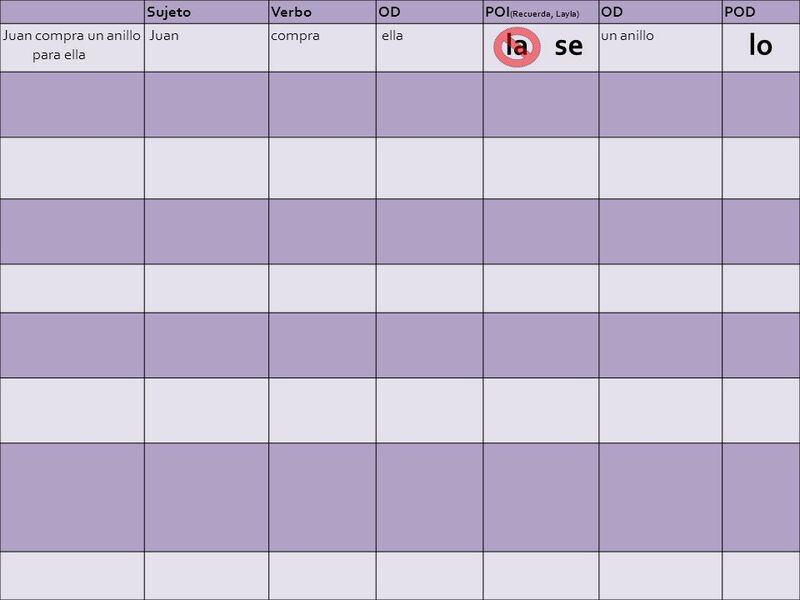 (la tarea) Él nos habló por dos horas. 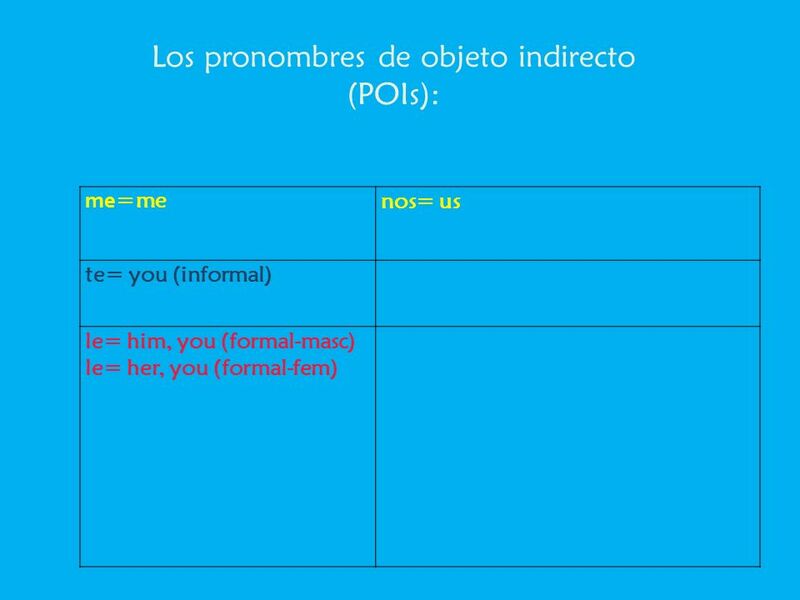 Direct and Indirect Object Pronouns. 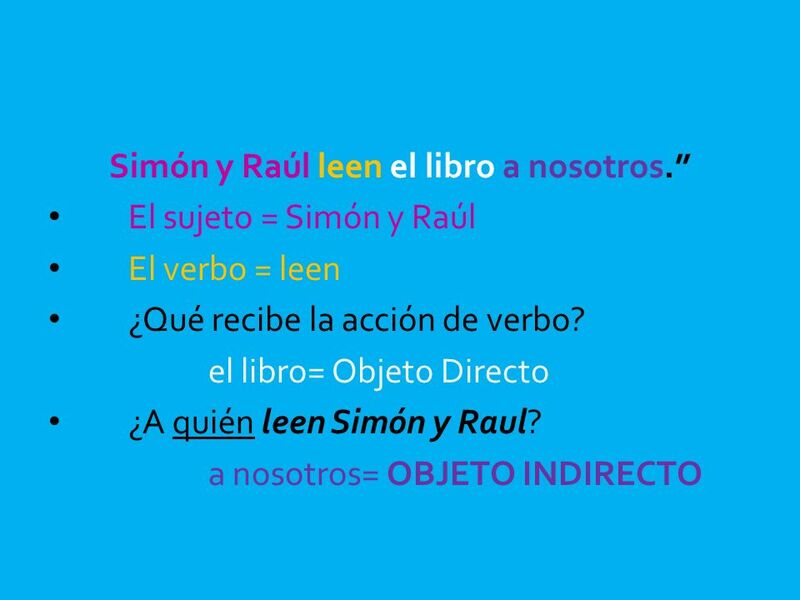 What are direct and indirect objects? There are two types of objects There are two types of objects Direct Objects. RID Español 4H.. 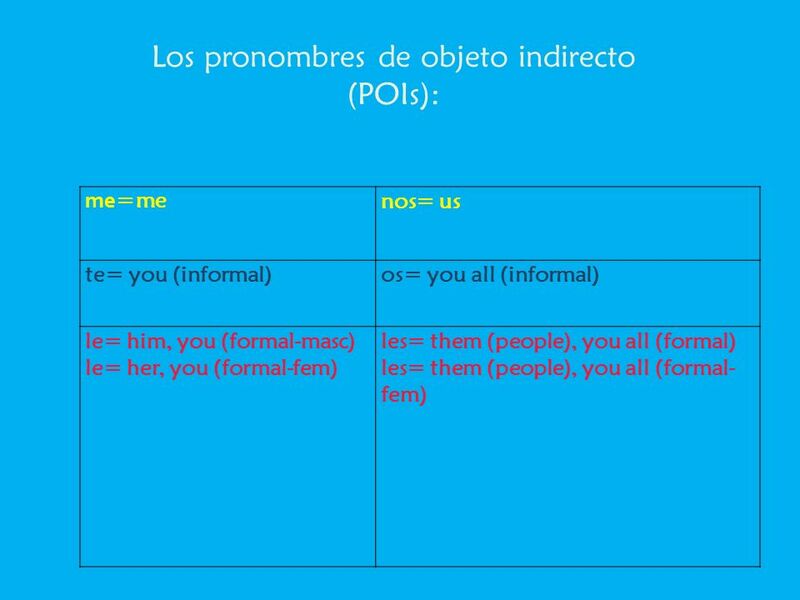 Double Pronouns.  ¿Me comprará mi madre la cadena de oro? ¿Me la comprará? 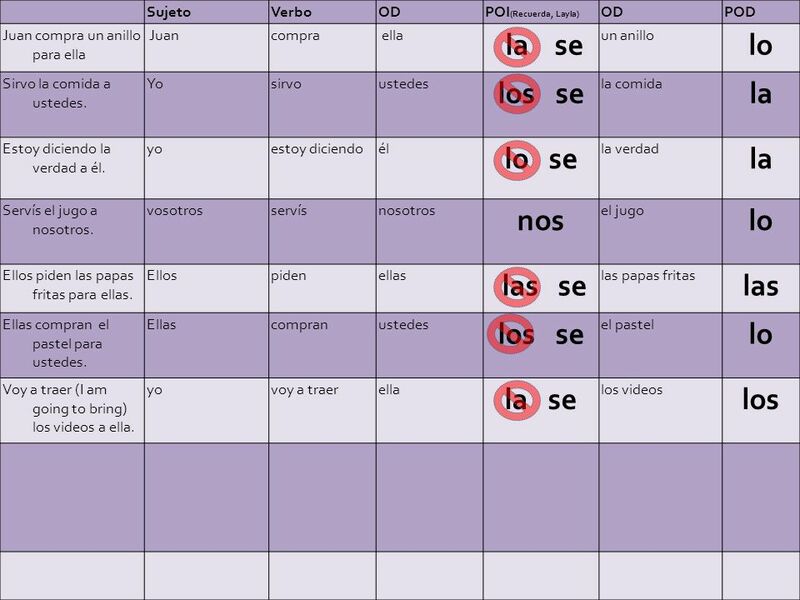  ¿Regalarán mis padres el Ipad a mi hermano?  ¿Se lo comprarán? 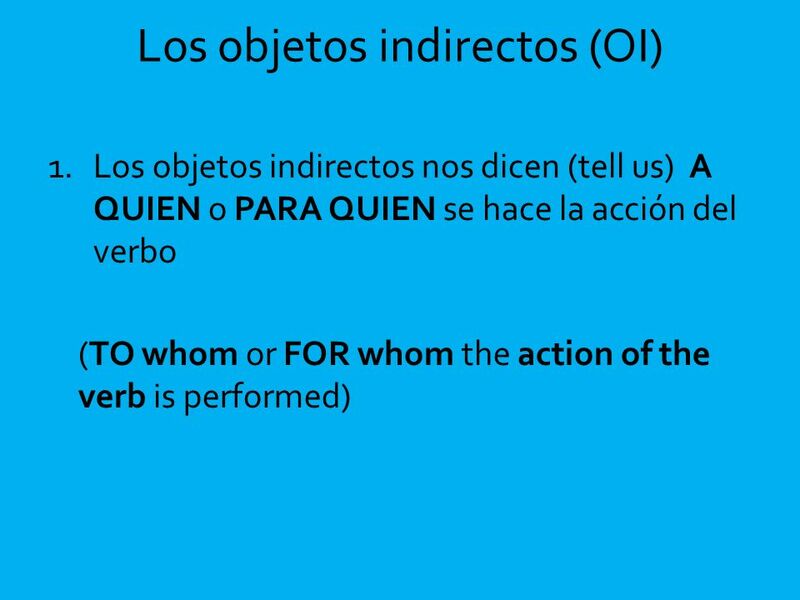 Double object pronouns When using both direct and indirect object pronouns at the same time in a sentence, the indirect object pronoun (the person) goes. 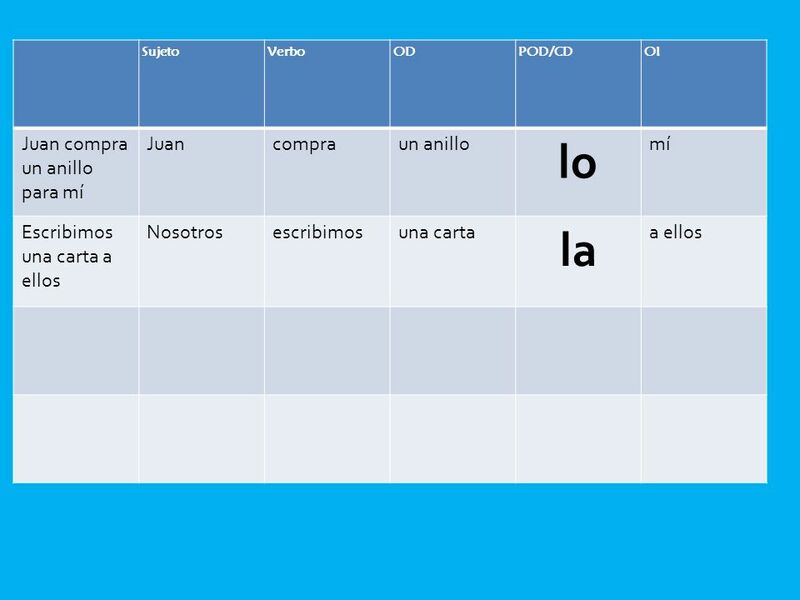 Gramática 2.1. Ej.) El peluquero le cortó el pelo a la señora. 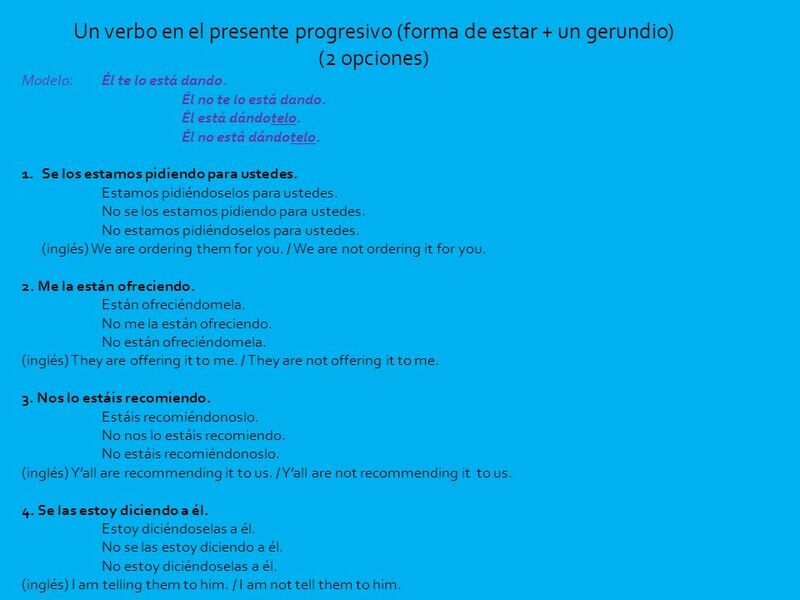 Indirect Objects and indirect object pronouns; dar and decir pg. 50 y 51 I. The _indirect__. 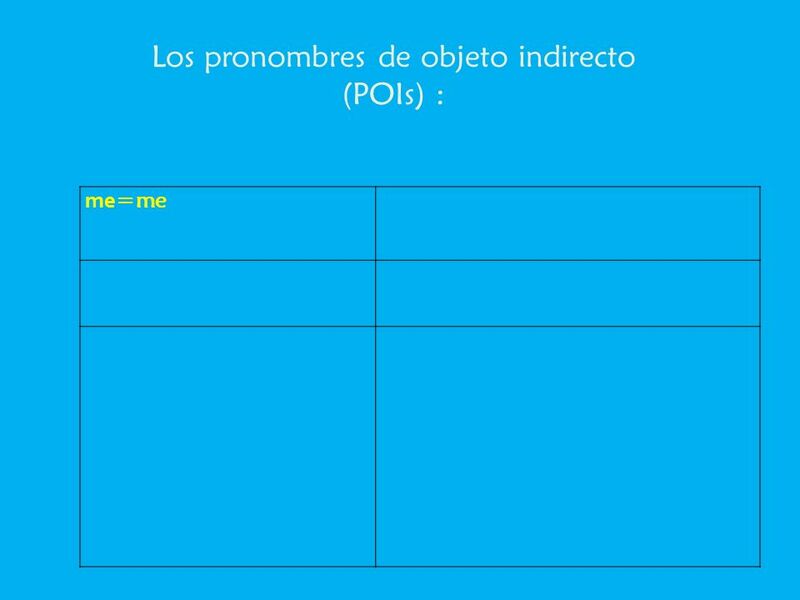 Los complementos directos Direct Object Pronouns. 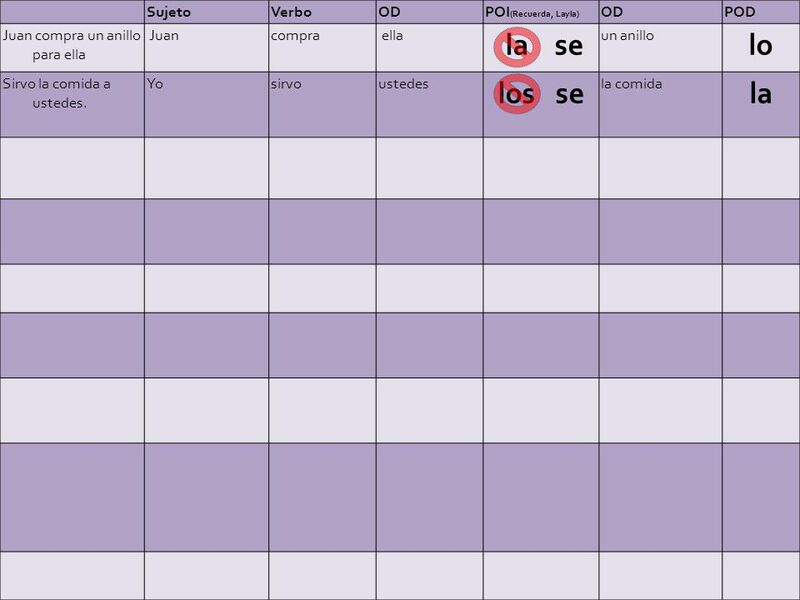 Español 3. Lección Preliminar Pronombres del objeto indirecto. 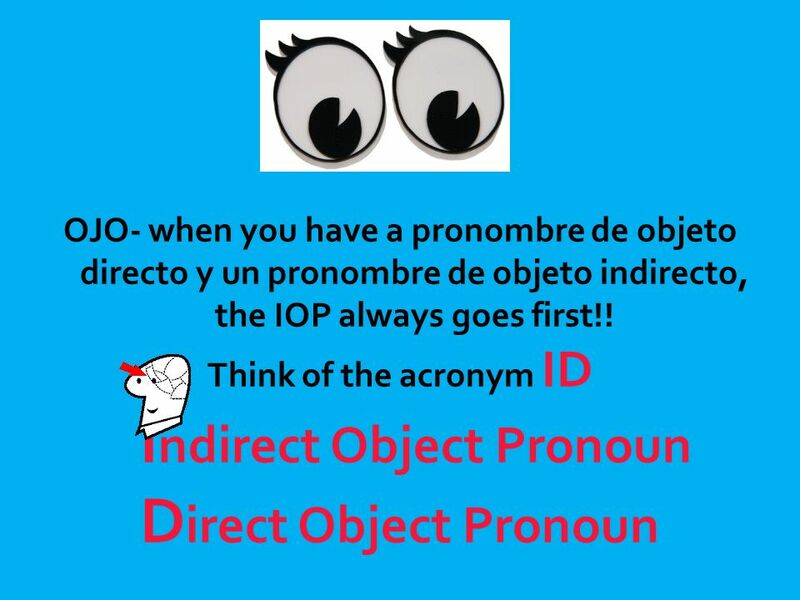 El Objeto Directo Direct Object Pronoun Sra. Altamirano.